Yesterday I was able to capture the sculptor and crew making final adjustments to a camarasaurus that stands three stories tall in the courtyard of the parking structure at the Denver Museum of Nature and Science. 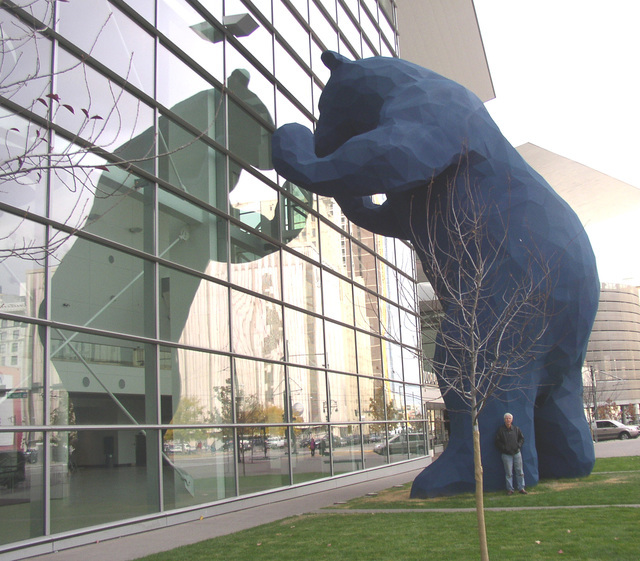 The committee for public art in Denver financed the project and the installation was timed to coincide with a new temporary exhibit which opened at DMNS today. I had no idea there was such a thing as a paleo artist but in talking with museum experts I now understand that when all you have is bones, it takes a great deal of scientific study to determine what the bodies of these animals looked like and how they evolved to be successful in their habitat. Today I went back to get a photo of the final installation. While his parents toured the new hospital and birthing center as a possible location for the birth of his new brother, we took Ethan to two favorite parks both within 3 miles of our home. The first, Bluff Lake, is a small lake and animal preserve. It is a favorite of birders, school groups and families . Ethan, who likes to "run with Grandpa," ran most of the 1 1/4 miles around the lake with just a few stops to look at ducks, geese and rabbits. Afterwards we drove to City Park to walk around the lake, watch the fountain and enjoy the sunset. 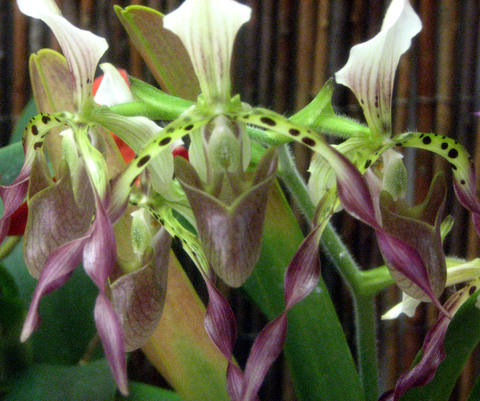 I had no idea when I went to the gardens--mainly to battle a huge case of cabin fever from being inside for 5 days of bitter cold and snow--that I'd accidentally chosen the day of the local orchid show and sale. Here are my nameless favorites. Of course, they didn't have them named except in the sale brochure which I'd arrived too late to receive! 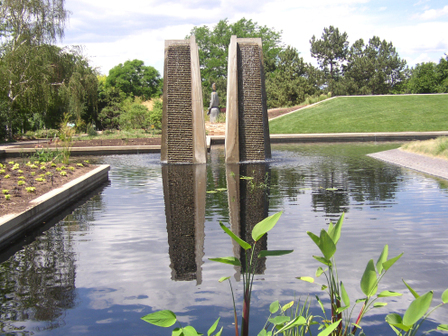 It is a relatively nice day so I bundled up, grabbed my camera and went to walk in the Denver Botanic Gardens. Though it is March, it can still act like winter and overnight we got a dusting of snow, but this morning the sun is out and temps are in the high 40's. 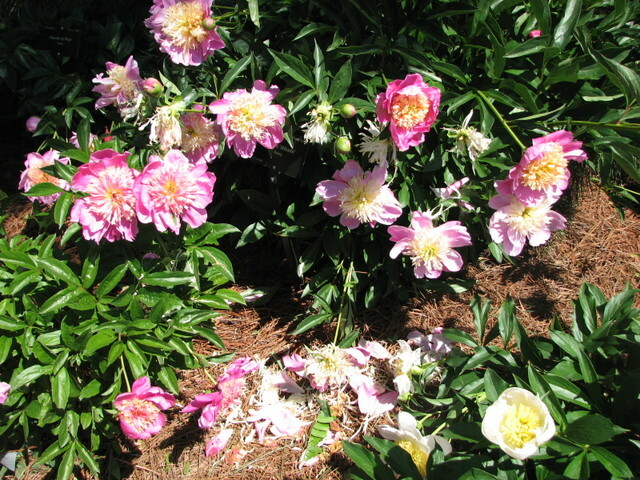 The gardens are still beautiful though not with the vivid colors of summer. 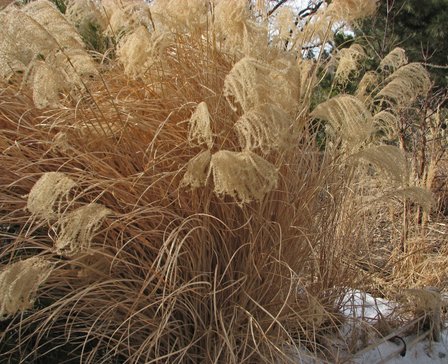 Dried autumn grasses are still holding on and waving in the sun even while snow lies at their base. Yesterday we went to the zoo with our grandson and the thermometer maxed out at a new record for the date: 74 degrees My son and daughter-in-law came over and put out the table and chairs on Saturday. Sunday it was cold again. Monday was 74. Today it topped out at 27. 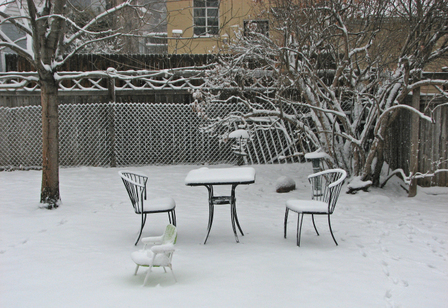 This is typical of late winter/early spring weather in Denver, but this year the extremes seem, well , more extreme! Rarely do we vacillate 47 degrees from one day to the next. It makes it hard to plan clothing, food shopping and even the next day's activities. I am suffering from too much winter along with election fatigue. I'm ready for Spring, sunshine, some political certainty and the end of the Republican dictatorship. One end of Monet Pond in Denver Botanic Gardens. When I want to experience autumn in many variations, I walk in the DBG which is about 8 minutes drive from my house. 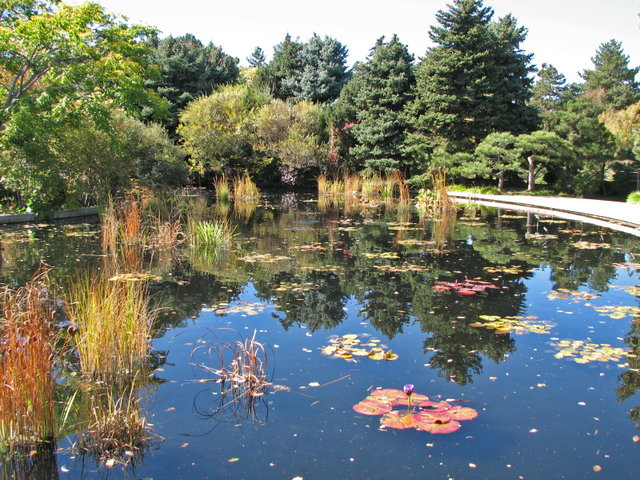 The bronze colors of the grasses and water lilies were absolutely breathtaking. 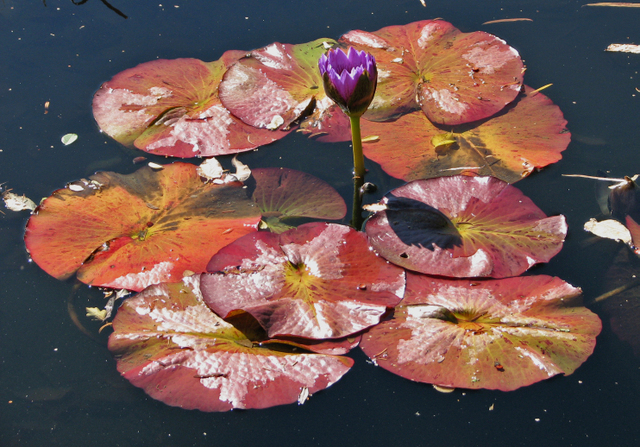 I was so taken with the water lily in front that I took a close-up of it as well. A final bloom on the water lily. Needless to say, autumn is my favorite season and most of my favorite colors are in the autumn spectrum. We had our 17 month old grandson sleep over at our house so that his parents could have a date night. We knew he would wake up early but we thought we could take him walking outside or take him to the park. He woke at 6 a.m. and it was raining. By the time we had changed him into day clothes and exhausted inside activities, it had changed to heavy wet snow. As we were leaving to meet his parents for breakfast at 9:15 I took the above photo. After breakfast my husband worried that, with the trees still fully leafed, the weight of the snow might break tree limbs so he took the hose with the nozzle on strong spray mode and hosed off the snow--just in case. The little guy went down for a nap while we fixed and ate a late lunch. By 2:00 p.m. the snow had begun to melt and by late afternoon bare spots were evident on the grass: An amazing taste of winter. Plant leaves show the hail damage of our 30-minute storm. Two days ago a rogue hail storm cut a 20-block swatch across central Denver, leaving our new blooming plants battered and drooping. We planned to go yesterday to the Botanic Gardens, forgetting about the storm as much of the city was unaffected. 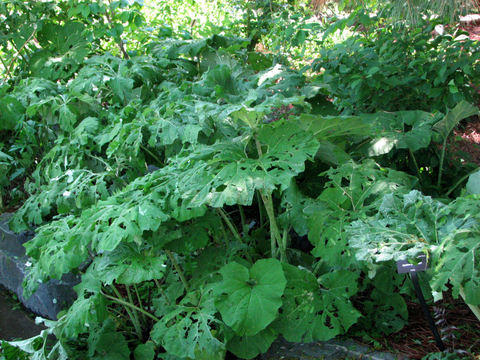 Sadly the large-leafed and high-profile plants took the brunt of it. The gardeners were able to vacuum up some of the dry leaves but the mallards remain purplexed by the leafy debris on the usually glassy surface of their favorite ponds. These are the things that won our hearts 38 years ago. I was pregnant with what I thought was our second child--turned out to be twins. My husband and I both grew up on farms and wanted our own "piece of land." We had thought to build but when we had three babies in diapers and a 45-minute commute to work, it was not practical at the time. 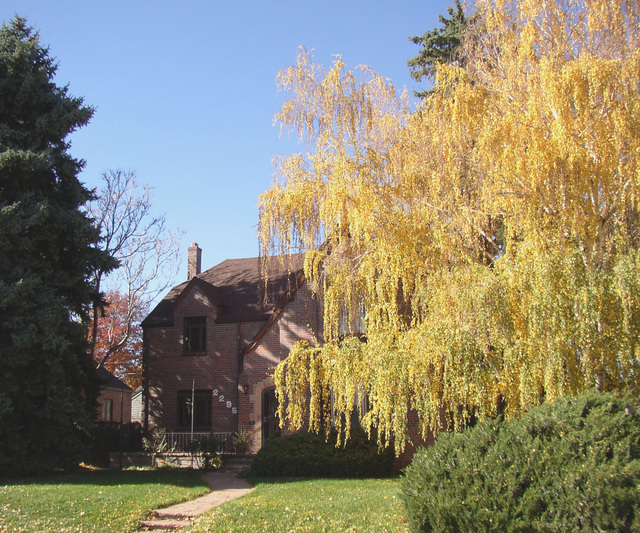 Over the years we fell in love with our community,our inner-city neighborhood, our 1940-built house and our urban lifestyle. Several times a year we would decide to go "check on" our land, to see the autumn colors of scrub oak, to climb the cliffs and look for petrified wood, to see snow on the trees and rocks or to picnic among the wild flowers. 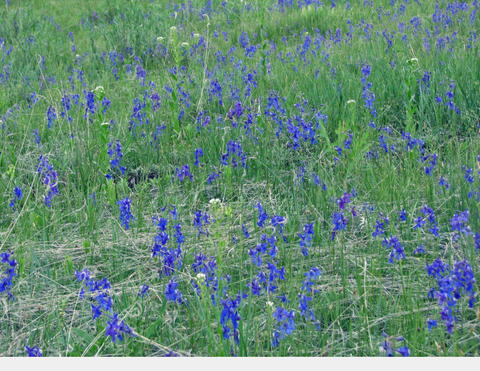 Wild flowers covering the meadow. Two days ago we went out to "walk on and love" our land. We have never named it. It has always been just "The Land" or "Our Land." 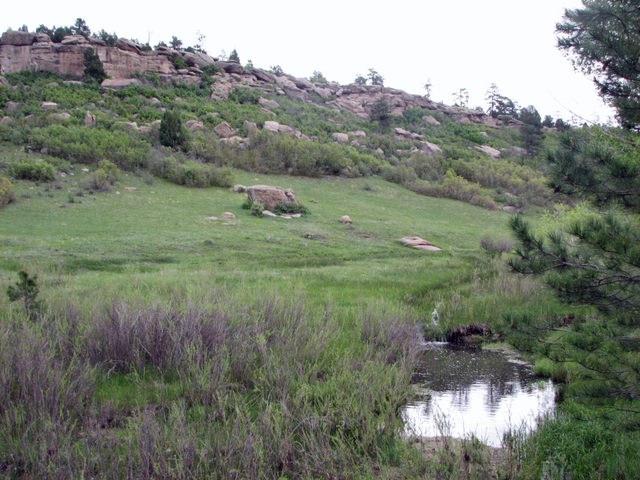 When our three boys began driving, they would go out and camp among the ponderosa trees. A group of their friends who had played soccer, done gymnastics, been on swimming teams and in Scouts with them adopted The Land as their hang-out, camp-out place. During their college years they would have reunion camp-outs. One friend, studying horticulture, decided to do some "housekeeping." He cleaned the trail from the road and placed rocks along the side. He cut some dead or dying trees into trunks for seating and created a rock fire ring for safe campfires. The boys, and now their wives and girlfriends, even chipped in for an environmentally friendly porta-potty situated at a discreet distance from the campsite. 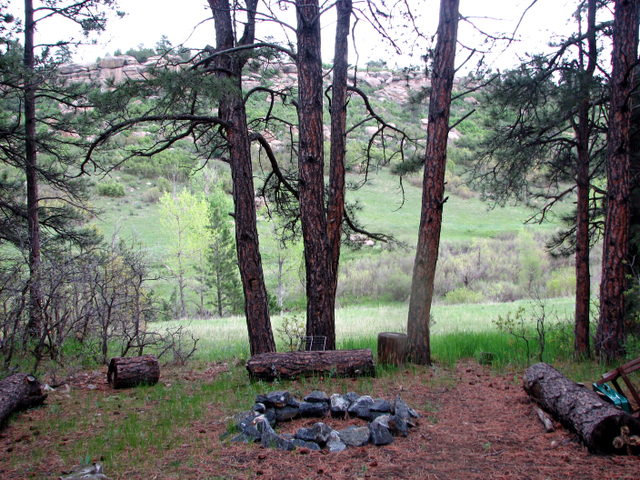 Fire pit in the trees, looking toward the meadow and cliffs. Tomorrow one of the last of the former "high school group" is getting married--just two months before their 20-year high school class reunion. I doubt that visiting The Land is one of their priorities for this weekend, but I wouldn't be surprised if some day we get a call asking if they could go out there for a while. 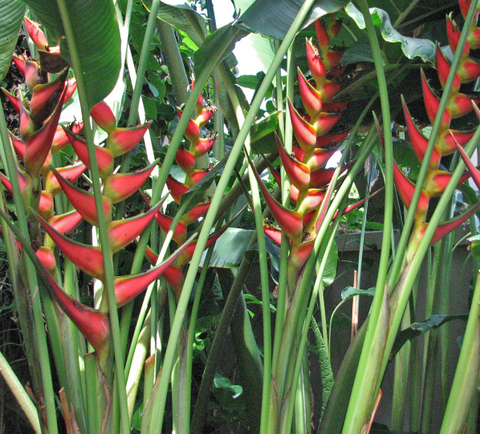 For three years--many years ago--we lived in Hawaii and I fell in love with tropical plants from the delicate and complicated protea to the simple green plants, some with leaves the size of elephant ears. 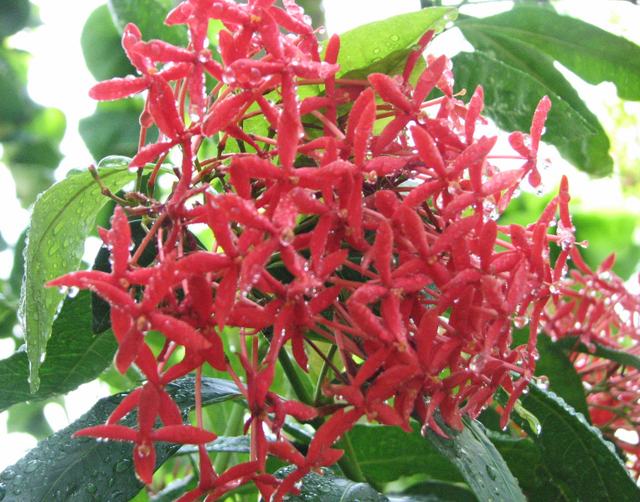 When its gloomy and I need a taste of color and warmth I visit the DBG atrium. Dew-drops on flowers after a mechanical misting. It isn't only the charismatic plants that fascinate me. 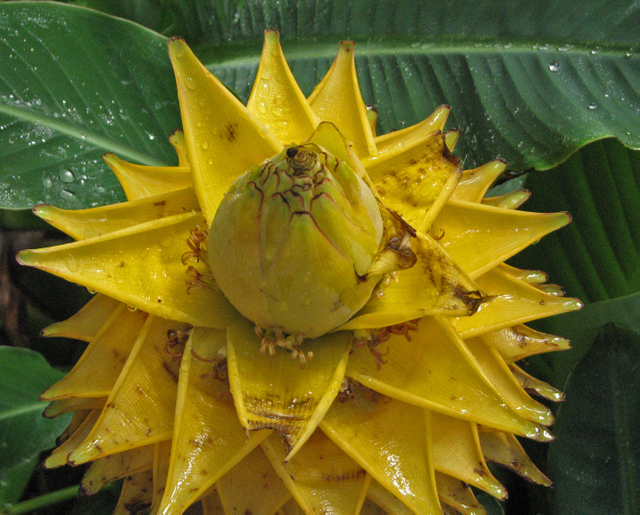 I also love the bulbous, protruding, thorny, imperfect and oddly shaped ones--like the one below. Other than the generic types like roses, tulips and marigolds, I usually don't remember names of plants but I am fascinated by shape, line and color of each plant and the impact of different combinations of those elements. I like both the "messy disarray" of the wilderness and the planned effect of the public gardens. Both have a place in my personal world. When I need an infusion of the tropics I go into the atrium. The room above features a tree trunk with epiphytes, orchids, and ivy plants growing on and around it. It is one of my favorite places to visit especially in the winter when Denver has snow on the ground. 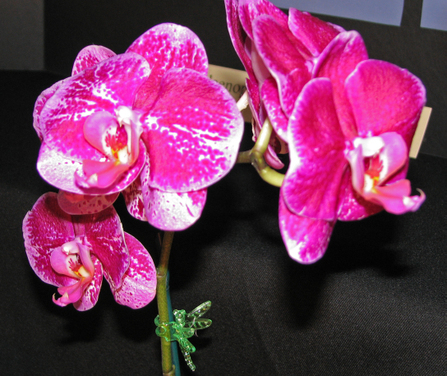 These orchids are only two of the many varieties, each with its own special color, design and shape. 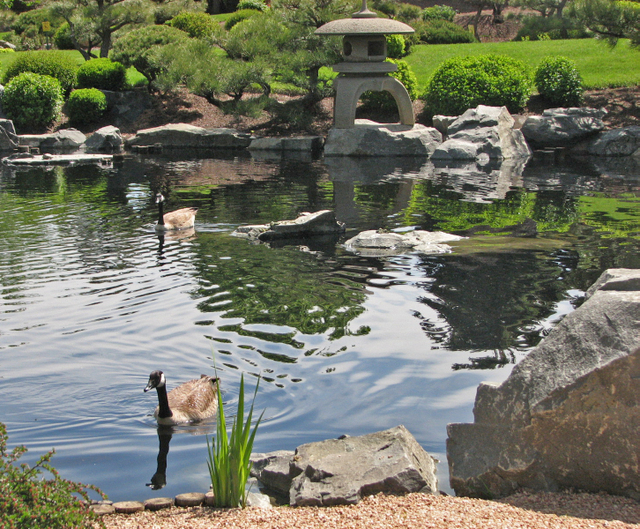 These Canadian geese found a home in the Japanese Garden. 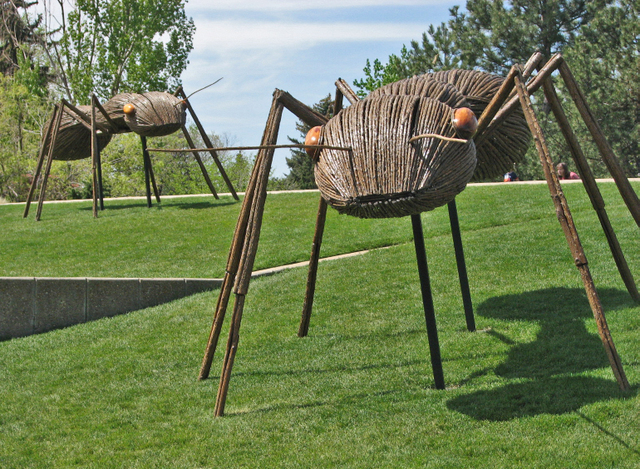 The Denver Botanic Garden has many "squatters" among the migrating birds. Mallards and Canadian geese choose this place to raise their ducklings and goslings. These geese are a mated pair that have not yet made a nest. 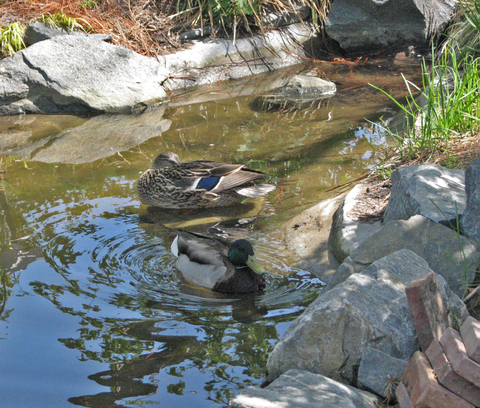 The mallards chose a pond in Plantasia--with a Chinese theme. 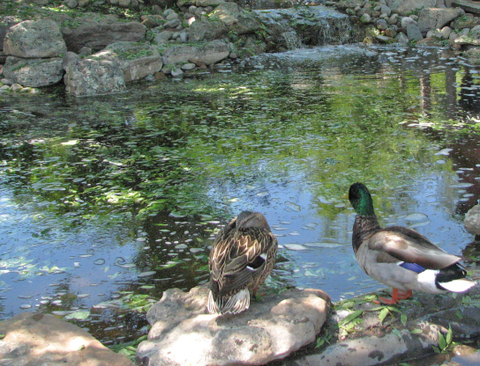 These birds have chosen my two favorite sections of the gardens. 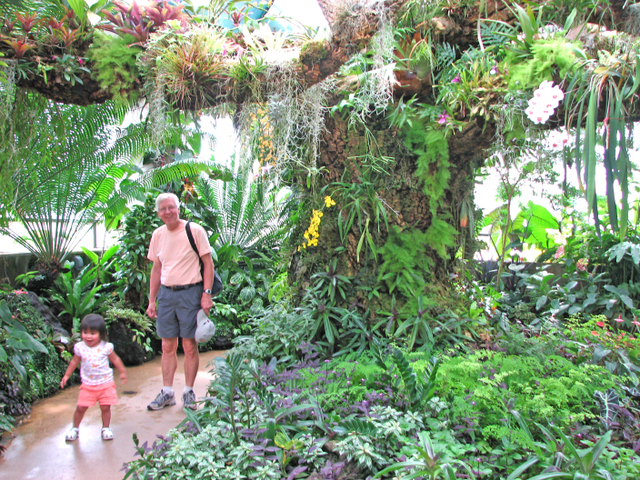 Plantasia features two moon gates, a pebbled path, a bell kiosk--and of course--Asian plants. 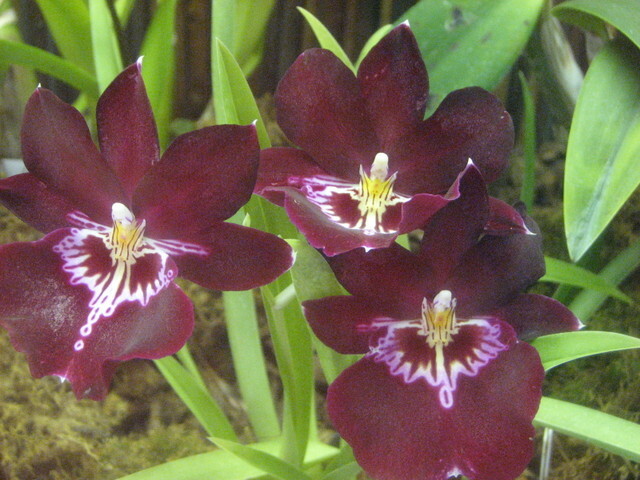 I try to visit botanic gardens wherever we travel and have seen some beautiful ones but few have such variety as ours. 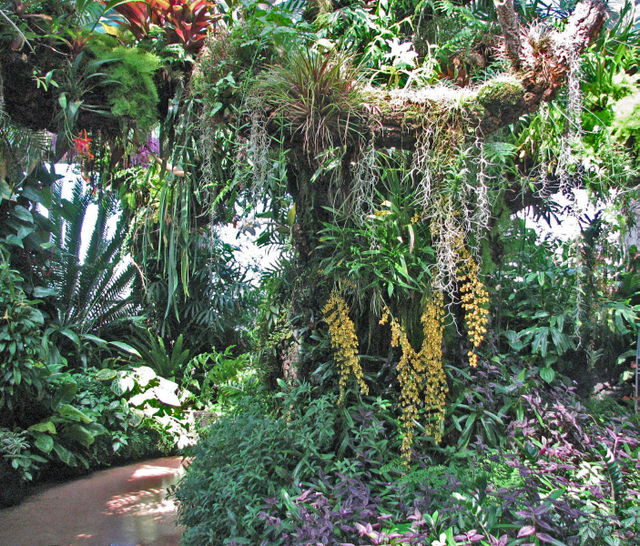 There is an alpine garden for high-altitude plants, an indoor atrium for tropical plants and the "cloud forest" tree complete with orchids, bromeliads and epiphytes. 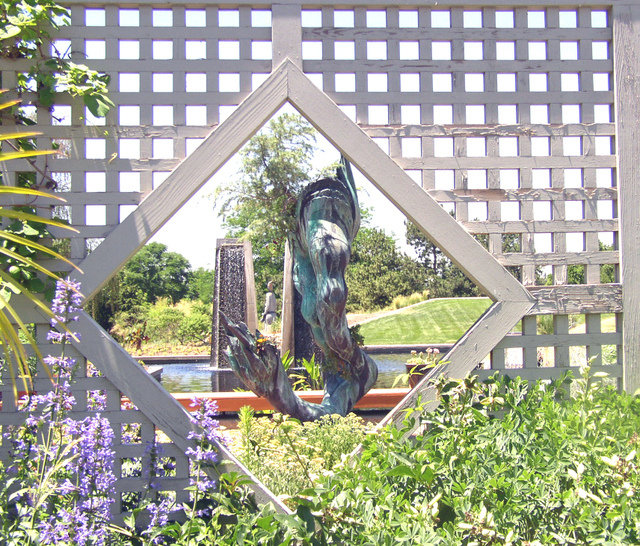 There is a pine forest trail, a children's garden, a Southwest garden, a tall-grass prairie garden as well as small nook-gardens featuring different species of herbs, grasses and flowers. 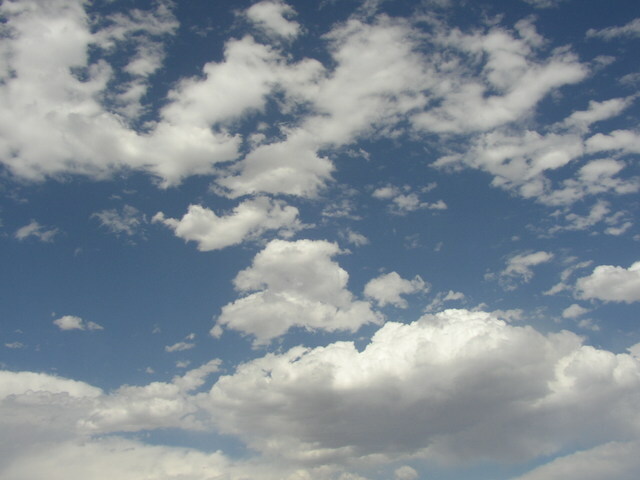 When I want to walk somewhere, write or paint--alone or with friends--or just be quite and feel small, I go to the DBG. What a bargain to have such a place of respite for only $40 a year! 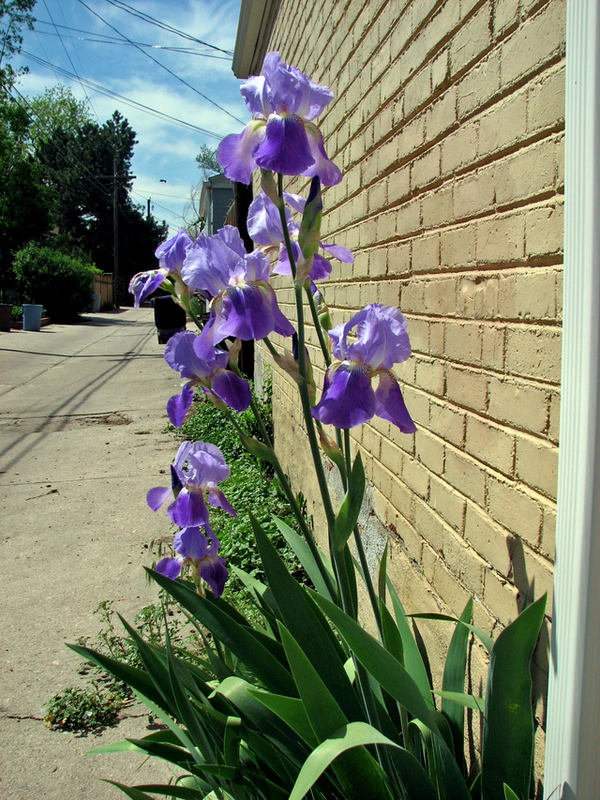 This Iris plant has bloomed every year in our alley. Nobody in the neighborhood knows who planted it or when. We've lived in our house for 34 years and it has bloomed every year. The woman whose garage that was, had lived in her house for 15-20 years before we moved in and she didn't plant it. Someone had thought to beautify this utilitarian passage with a little color. 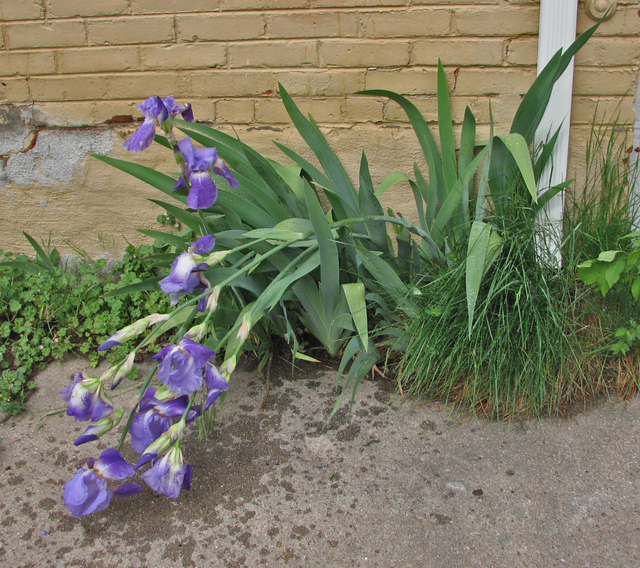 The rest of the plants are a combination of ground cover and weeds but this iris makes me smile every year. Yesterday I took this picture, along with the close-up below. During the afternoon our daughter-in-law called with a small emergency with the garage door of the house they had just moved into the day before. My son was unable to go home so we went to help. We stayed for dinner. We were gone about four hours and left during a drenching thunderstorm. When we returned home the storm had already passed our area and left in its wake a cowering Iris, water still dripping from its leaves. 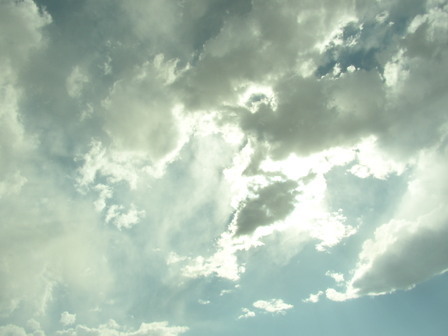 The weather bureau said this storm was the worst in 50 years. Two people died in the flash floods caused by this storm, one a small child in a stroller that was swept by the sudden current in an underpass where the mother had run for shelter from heavy hail stones. 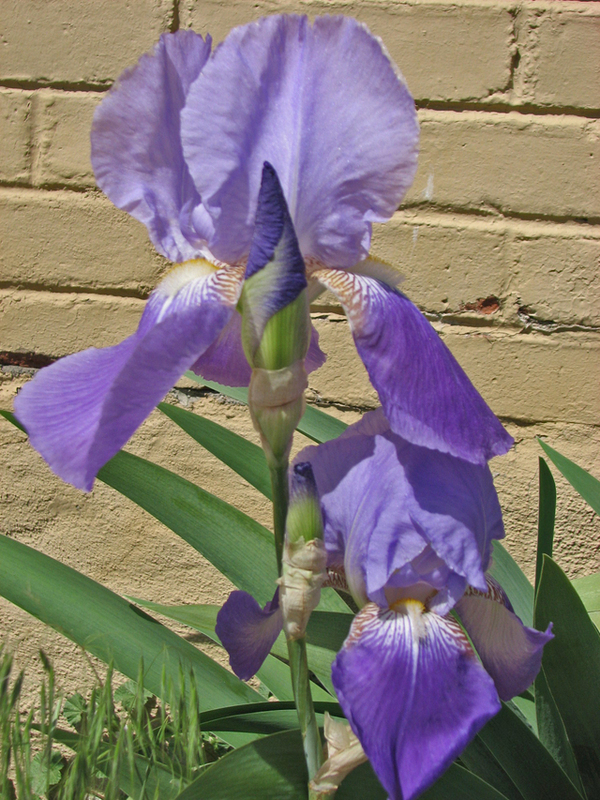 In light of that it is definitely inappropriate to be sad over an Iris, so I'll just prop it up, enjoy it while it lasts then wait until it blooms again next year. Large wooden ants are part of the"Big Bugs" Exhibit. 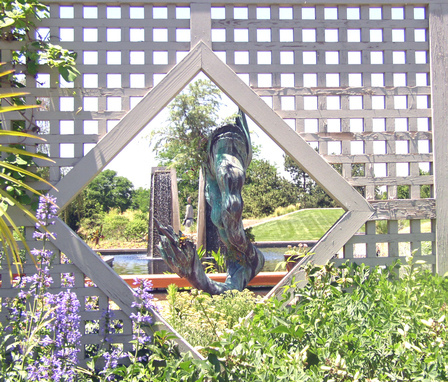 Each of the last 3 summers the Denver Botanic Gardens has sponsored special exhibits of garden art. This year it is Big Bugs. 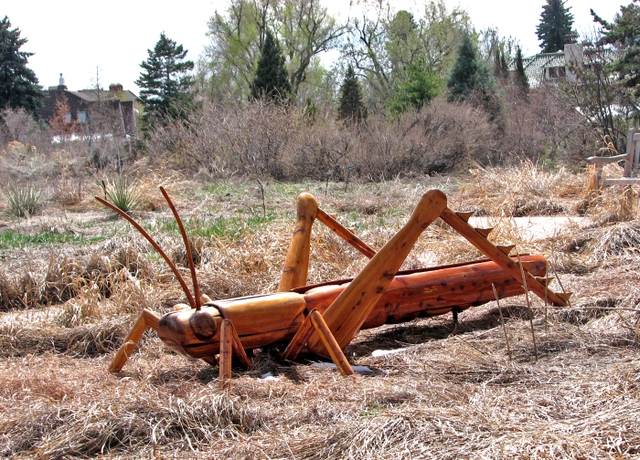 There are spiders, praying mantis, ladybugs, dragonflies and grasshoppers. I've chosen just a few of my favorites. 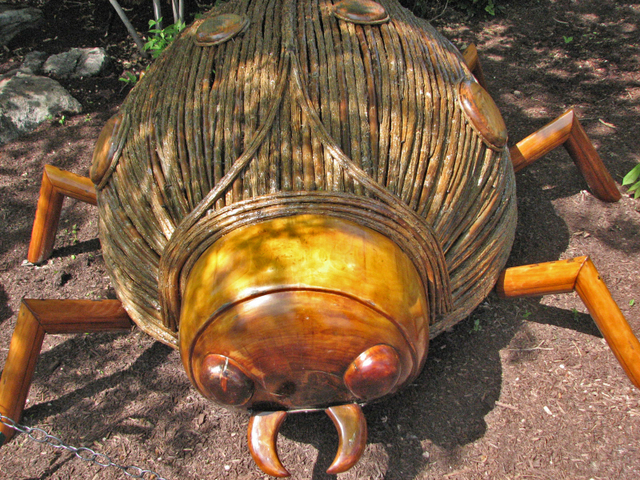 Wooden ladybug with polished circle "spots"
Grasshopper in the still-brown prairie grasses. Zoo, through a child's eyes! In January I had renewed my zoo membership because by renewing early I saved $10. Somehow my card never arrived in the mail so I stopped by to check on it. I took my camera with me as we were going to take Clio after we picked her up at day care and I didn't want to take my camera then. It's too tempting to try to catch the animals in different poses and I wanted to spend quality time with Clio and answer her questions. The cranes above are always busy and usually too near the glass-fence to get anything but a shot over the fence looking down at the top of their heads. Today I got not only one but both of them at a sufficient distance to catch the quirkiness of these gorgeous birds. 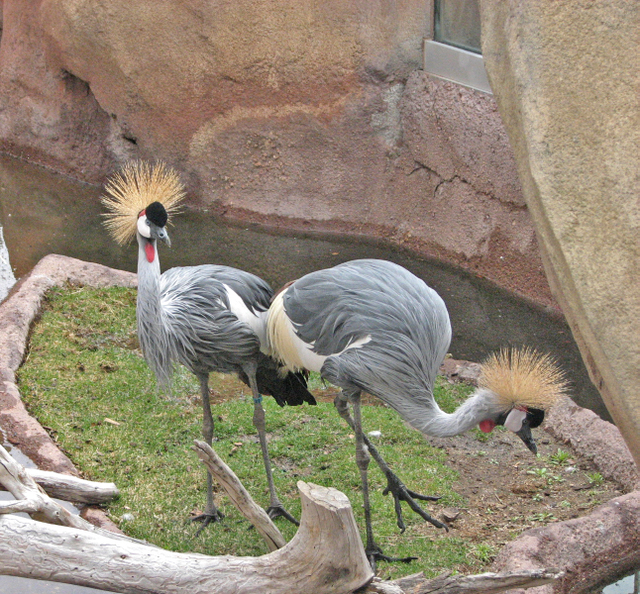 It was 4:00 p.m. when we arrived at the zoo, but since summer hours are in effect we could stay until 6:00. We asked Clio what animals she wanted to see and were surprised when she said, "snakes." We first looked at the python then went into Tropical Discovery where they house both ground and tree snakes. She loved the designs of the snakes and the tiny bright-colored tropical frogs became her new favorites. I always love the zoo but seeing it through the eyes of an almost 3-year-old is a special treat. We were walking along hoof stock highway when she spied--a good city block away--what she called the "ceracal". It had been a long time since we'd been there and I was surprised she got the name that close. I said, "Do you want to ride the carousel?" Of course the answer was yes. We arrived in time for the last ride of the day and it was just the 3 of us so she could choose from among all the zoo animals. She narrowed her options to the Okapi, the Cheetah or the Zebra. The Zebra won. A Fan of the Game! I love baseball. I became a fan when major league baseball came to Denver in 1993. I took these photos on Opening Day of this year but have been busy with daily demands and haven't really had time to blog. 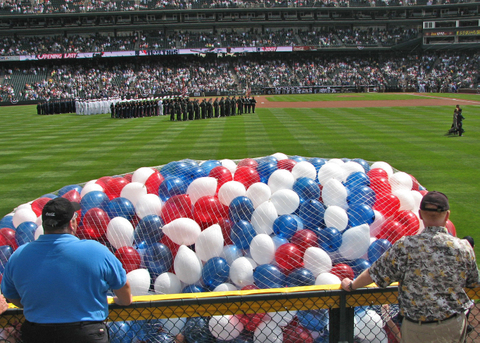 Yesterday was a beautiful day for baseball--sunny but not hot. From the beginning the game was filled with action--and emotion. The Braves had won the first two of three games and Atlanta fans were enthusiastically waving brooms in hopes of a series sweep. The score see-sawed until it was tied 5-5 as Atlanta opened the 7th inning with back-to-back singles. Chipper Jones hit a hard line-drive to our shortstop, Troy Tulowitzki and Troy turned it into an unassisted triple play--only the 13th one in major league history. In the next inning Andruw Jones of Atlanta attempted to score from first on a double to center. Troy, again the hero, took the throw from center field and made a spot-on throw to home plate for the out. Through the 9th, 10th and the top of the 11th inning the score remained 7-7. In the bottom of the 11th Matt Holliday hit a 2-run walk-off homer to win the game, 9-7. We have seats for 26 games this year and, though I'd love to see our team win more often, I will gladly go to the games just to see plays like we saw today (even the magnificent catch made by their right fielder). 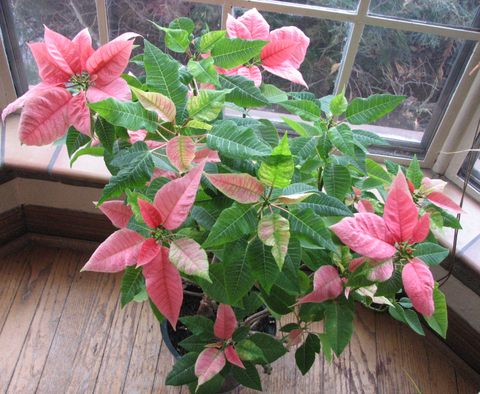 I had given up on getting a poinsettia to repeat its beautiful colors after the first holiday season. This year I did it but I'm not quite sure how it happened. It was such a beautiful bushy green plant after the red leaves had disappeared that I kept it inside until summer and then put it outside. When the danger of frost threatened in late autumn, it was still a nice green plant so I brought it inside and gave it plant food with every watering. It didn't make it for the Christmas season but about January 15 we began to see some pinkish leaves appearing--and then more and more until today this is the way it looks, not as lush and full as its first incarnation but certainly a colorful addition to our table. If it lasts until summer we may try for a third season. Wow! This is more snow in two weeks than we've had in the past two winters--and this is supposed to continue for two more days. 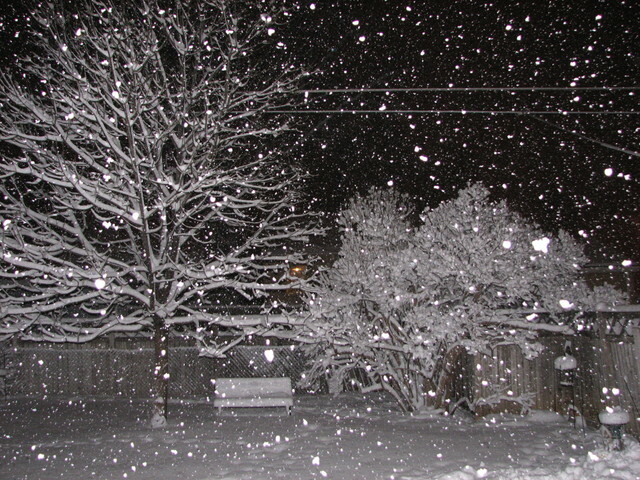 7:00 p.m--still snowing and oh so beautiful! After two hours of shoveling, the walks are cleared. We were ready but neither newspapers nor mail were delivered Wednesday, Thursday or Friday. We had lots of reading time, computer time and cleaning time. After suddenly taking 5 days out of our lives for Bob's brother's funeral and leaving a mess behind us, we needed to do a major cleaning--and we had plenty of forced time. We are at the end of the alley so if we don't clear our section to the street, everyone else's cars are held captive. The photo below is of Bob shoveling the drive and alley. Actually most offices and all schools were closed and most people had enough warning to stock up on food and gas so problems were minimal. 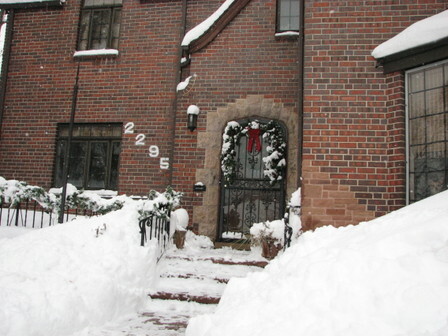 One neighbor actually bought a snow-blower before the storm hit so he was the envy of the neighborhood. I can't believe it's been over a month since I posted. Things just seemed to get in the way of our plans. When we returned from Spain we began to tie up loose ends with our basement project: installing new flooring, painting the walls and sorting through years of accumulation to toss the non-functioning and unusable. We finished that just in time to welcome company from Germany, Brazil, and New Mexico. More recently we kept our granddaughter Clio for 3 days while her parents went to a wedding in New York. We loved every minute but long sessions at the computer posting and reading just didn't happen. Hopefully in the new year I will have more time to take photos and write, two things I have missed greatly in the last six weeks. The rest of our trees were not harmed. The maple and ash had already lost their leaves. The spruce, junipers pines and the weeping birch tree had no problems. 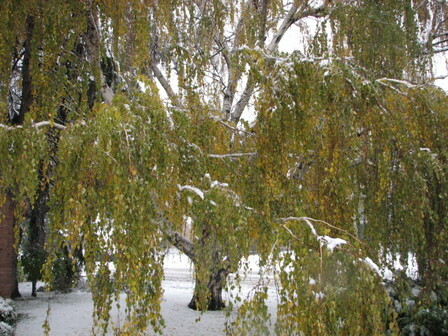 In fact the golden leaves of the large birch contrasting with the snow in our front yard is quite beautiful. Of course this beauty came with below-freezing temperatures and shoveling requirements to clear the sidewalks and driveway. Ttime-consuming as it may be to clean up after, it is still beautiful and contains much-needed moisture. We only got about 5 or 6 inches. 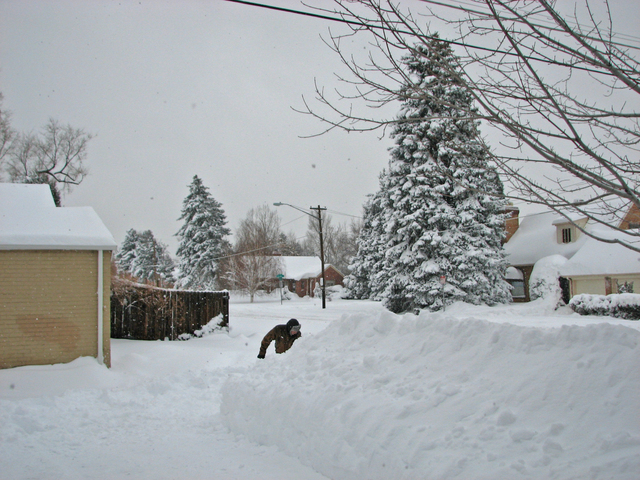 Some people in the foothills (Conifer and Evergreen) got 30 inches. 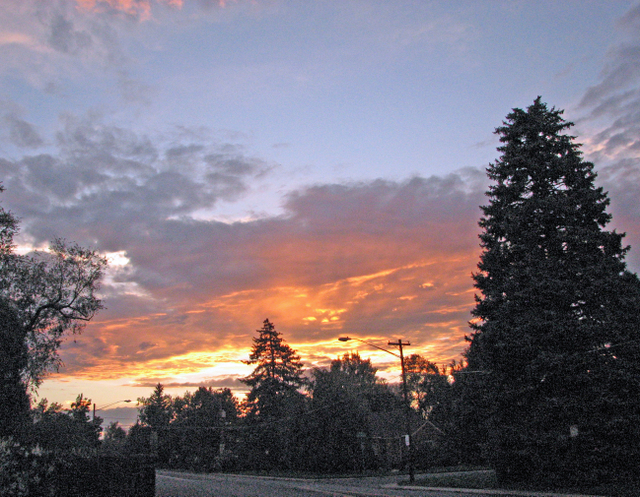 A sunset from our back yard about 8:00 p.m.
We are in transition from Summer to Fall, from vacation to school, from shorts and sandals to long pants and close-toed shoes and from cloudless late afternoons to dark thunderstorm clouds coming off the Rocky Mountains. The clouds only bring rain about a third of the time but the sunsets are spectacular. 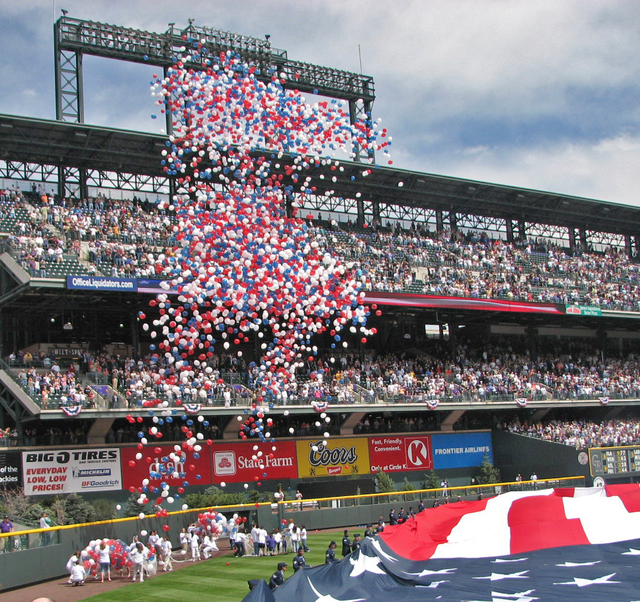 Picnics and concerts are winding down, baseball is about to end and football is gearing up. Labor Day weekend, summer's last hurrah, is 3 days away. I'm moving my summer clothes to the "stand-by" closet and returning the dark, sturdier, warmer clothes to the first string. I enjoy summer festivals and happenings but my favorite season is autumn. The crispness of the air, the taste of hot soups, roasted root vegetables, squash and pumpkin dishes and , of course, the autumn palette brushed over the pre-Halloween world are all reasons I love the season. On Labor Day we will make yet another transition: from home to away. We are leaving that morning for Northern Spain--Catalonia and the Basque country. I can hardly wait. The last few nights I have been packing my suitcase in my sleep, hoping this time to pack lighter, to not take things I really don't need. 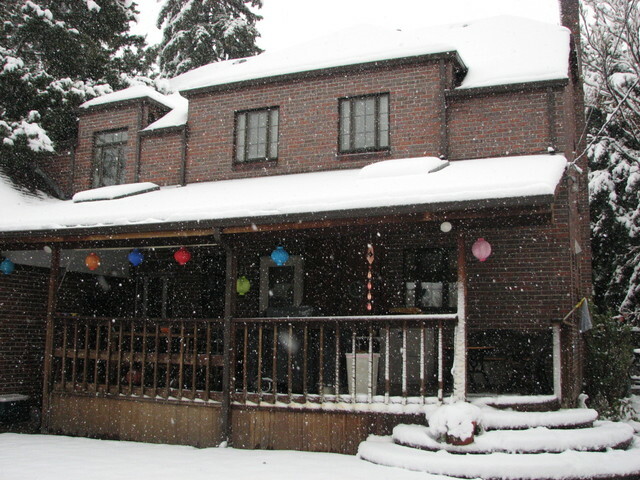 We'll be staying with friends whose daughters both stayed with us while studying English and other courses. One of the daughters will be our house and animal sitter while we're gone to visit her parents. One of our granddaughters favorite things to do is visit the "cloud tree" at Denver Botanic Gardens. I love it too. 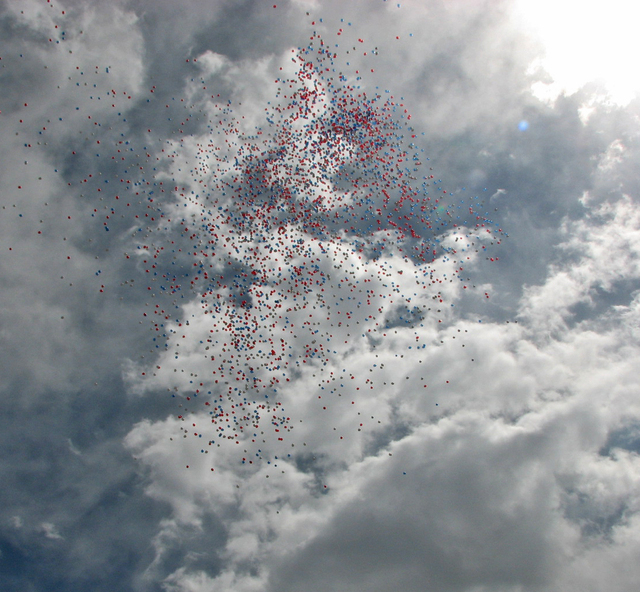 If we're lucky we find ourselves there during one of the frequent "mistings" that occur throughout the day. At those times the room displays an authentic foggy rain forest atmosphere. I've visited rain forests in Brazil, Puerto Rico and Hawaii but I really want to experience the Monteverde Cloud Forest in Costa Rica. At this link you can find information about Cloud Forests--and if there is current activity, the quetzl and hummingbird live cameras will be on. My white-haired honey finishing the half marathon on Saturday. I am so proud of my husband. He has been a runner since he was around 35 years of age, has completed 11 marathons--including the Boston, and many half-marathons. 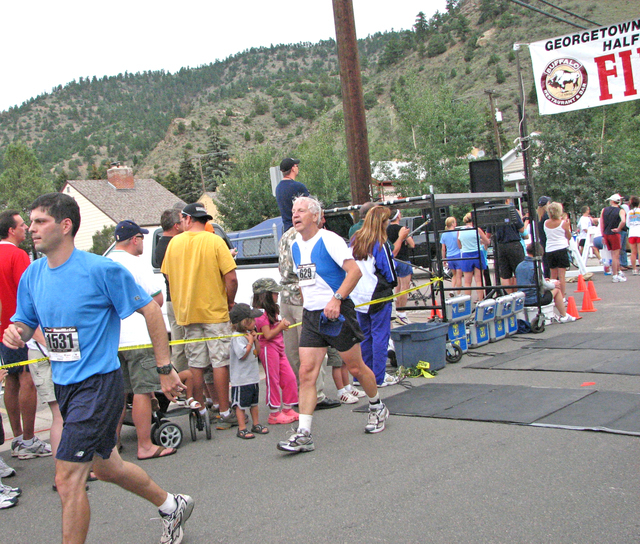 This year was the fourth time he has run the Georgetown to Idaho Springs half-marathon--a beautiful run through the mountains from one old mining town to another. The weather was perfect, just cool enough to be comfortable for the 13.11 miles. He and a running buddy had left home at 5:00 a.m. yesterday morning to get there and be ready for an 8:00 a.m.start. I drove up later and arrived in time to see the first runner cross the finish in just over one hour. 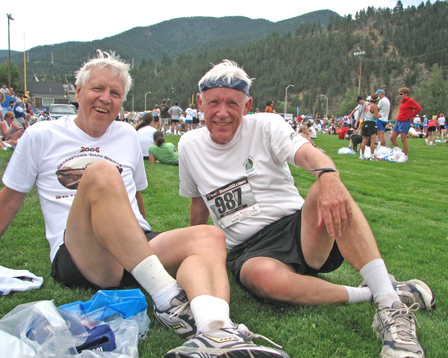 B and his running partner, 67 and 68 respectively, finished at 2 hours 17 minutes and 2 hours 31--at altitude. After the race, the sponsors served fruit, bagels and yogurt in football field of the Idaho Springs Gold diggers, a perfect grassy area for meeting family and relaxing while the awards were given. Two senior runners after the race, husband on left. 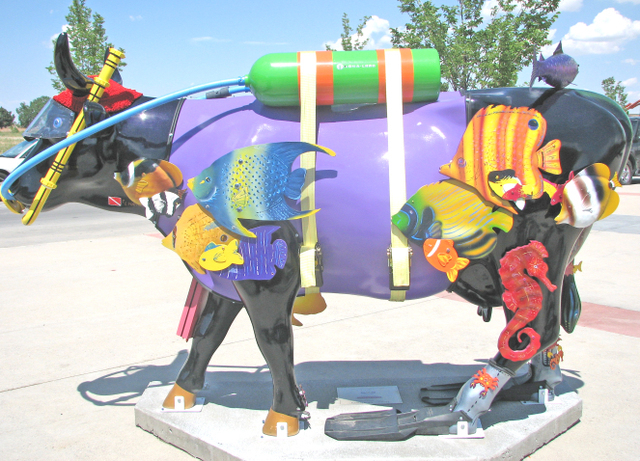 This cow entitled Jacques Moosteau is one of 100 in Denver until October. 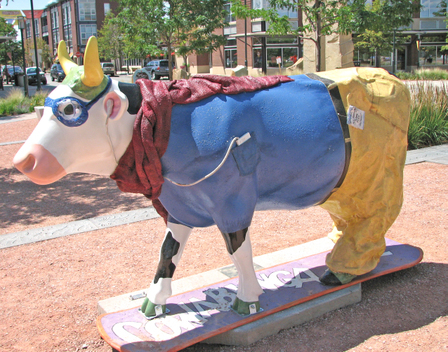 I've lived in Denver almost 40 years and during that period much time, energy and money has gone to marketing Denver's diversity in an effort to dispel its reputation as a "Cow Town." 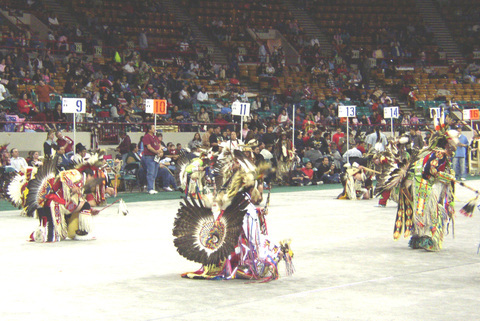 Denver has long been the home of the National Western Livestock Show and Rodeo held for two weeks every January, but it is also a city of much energy and cultural diversity. 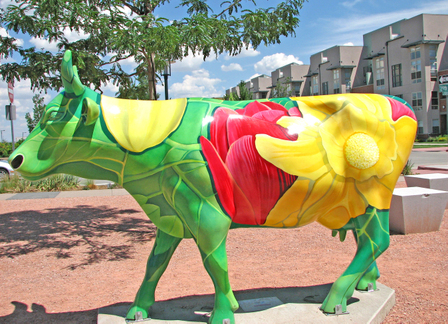 Now, ironically, after years of down-playing cows, we have imported 100 artistically decorated ones to be on display as part of Denver's Cow Parade beginning this week and lasting through October. Below are a few more cows. 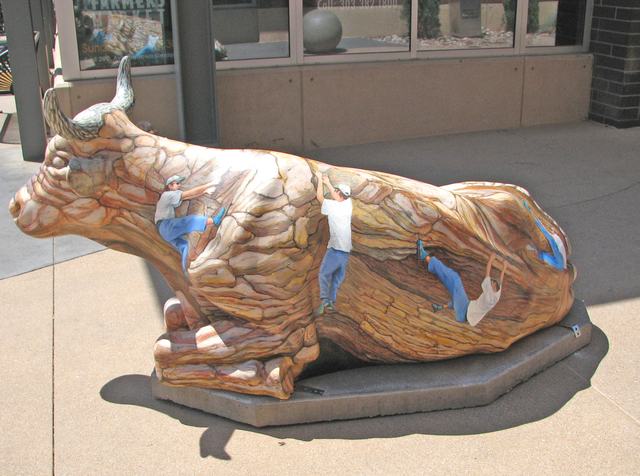 Also check this link to see more of the variety represented by the Denver Cow Parade. 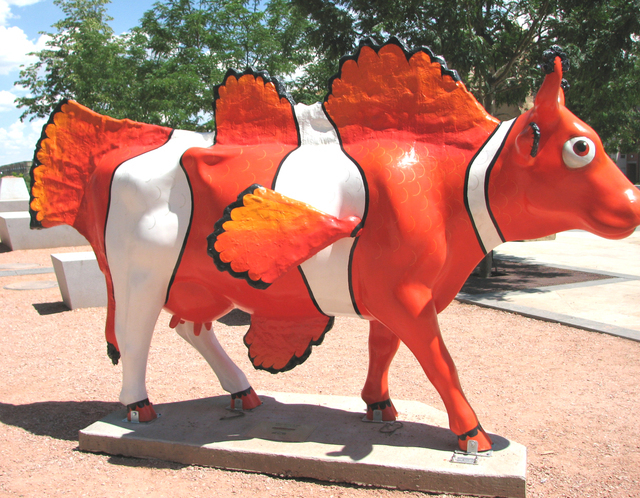 I failed to get the name but it must be either Clown Cow or Nemoo! One more, also without name. 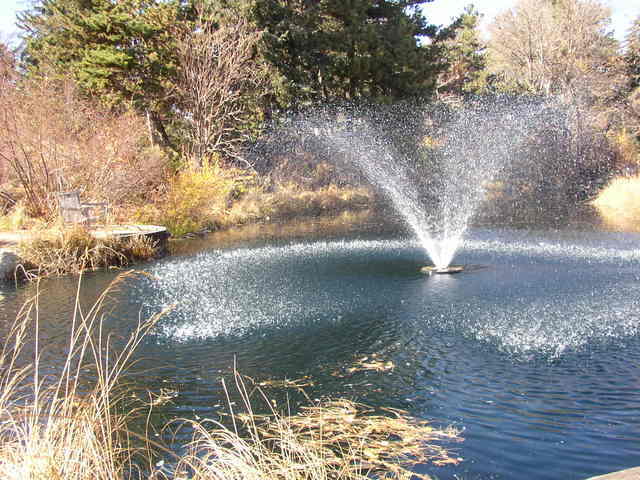 While they were working on the Japanese gardens in my previous post, the zoo staff moved the koi to another pond. 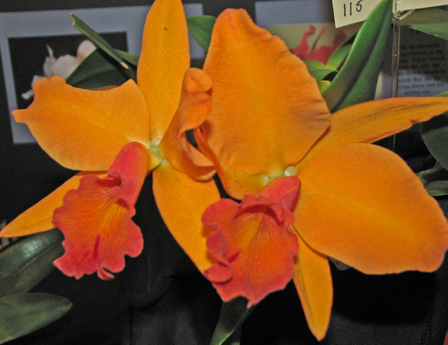 During the two years they grew and multiplied. Now I'm guessing it would be a formidable task to catch them all and move them. 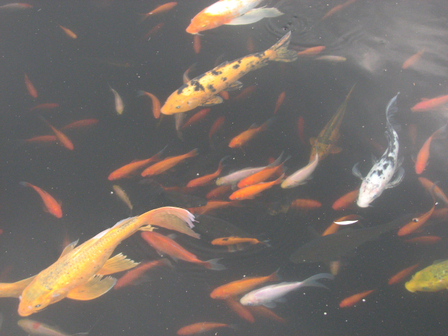 They have stocked the new pond with small fish who will grow into their surroundings. Meanwhile, these lovely specimens come whenever someone steps onto the platform where they are fed each day. 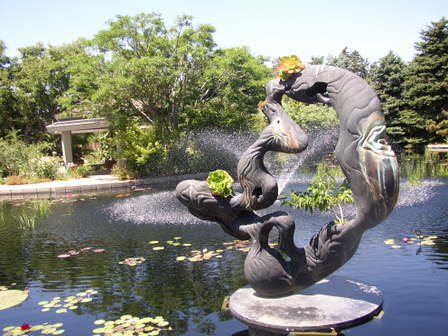 I never see Koi without thinking of the Byodo-In Temple, on the island of Oahu, Hawaii, with its many colorful Koi which we saw many times during our three years living in Hawaii Kai. Every Monday we try to do something experiential with our granddaughter Clio. 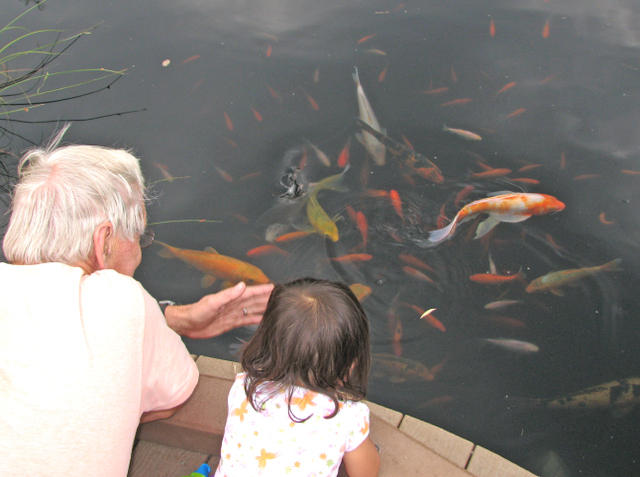 This past Monday we went to watch the koi. Grandpa loved them too. 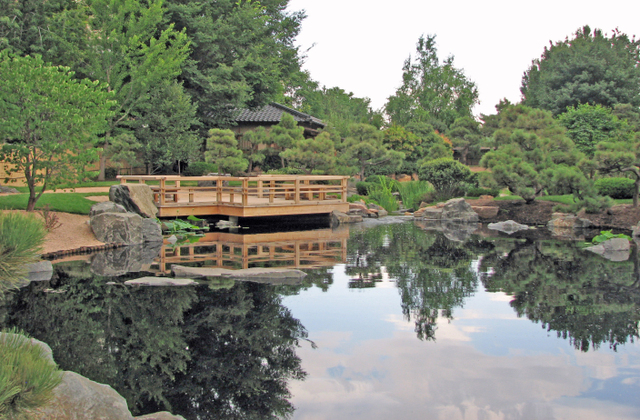 When I used to visit the Botanic Gardens I would always spend time in the Japanese garden sitting under the huge shade tree near the teahouse. During my first art classes I took my sketch book and drew from my shaded-tree viewpoint. Two years ago the old tree died. 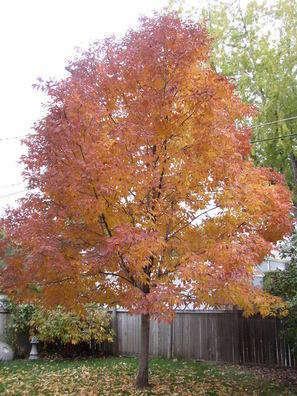 I never bothered to learn what type of tree it was but I loved that tree. On one visit after a few months absence I went to my favorite spot and the tree was gone. For two years, that part of the garden has been under construction. The crews drained the pond, moved the koi, rearranged rocks and paths and built a viewing platform with benches for seating. It re-opened this summer and is truly spectacular, with a great view for sketching or photographing. But, I still miss my tree! Last Saturday Bob and I joined our friends Dave, Paula and Lori for a concert at the Arvada Center. We arrived early enough to get a good place on the grassy slope--slope being the key word as our calf muscles got a good workout just keeping us from scooting down the hill and taking those in front of us to the bottom. We had a great view and the sound was fantastic. We had stopped at Chipotle on the way and picked up food to enjoy. Lori brought fruit and drinks to share. I had never seen the group in concert but I have loved their music since Paul Simon included them on his Graceland album. 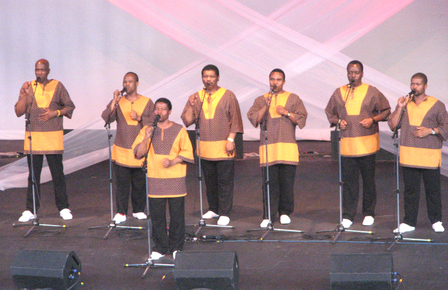 Their homepage lists 9 members although only eight were on stage during this concert. 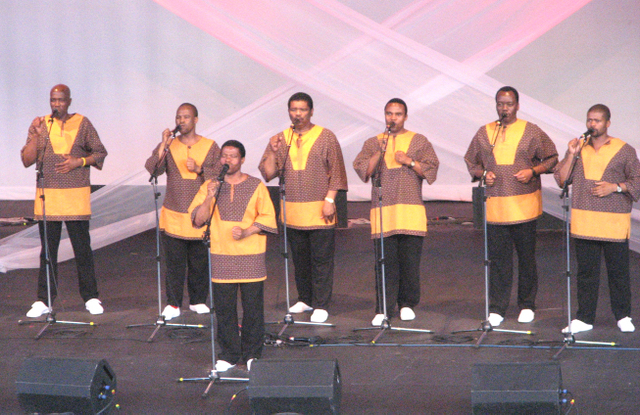 Their harmony is haunting yet mellow and the effect was soothing and peaceful. Great music and great friends produced a most enjoyable night. 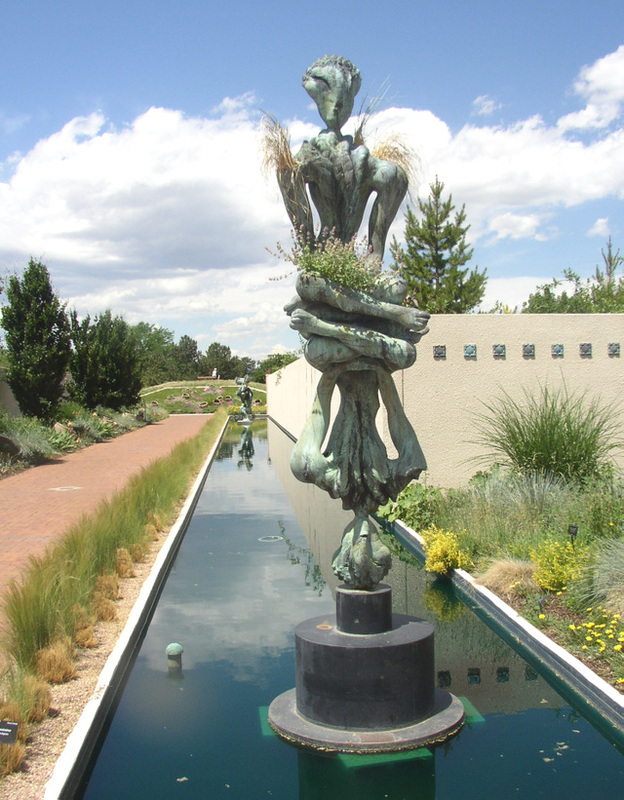 One of the things I like most about the DBG is that there is a balance between art and plants. 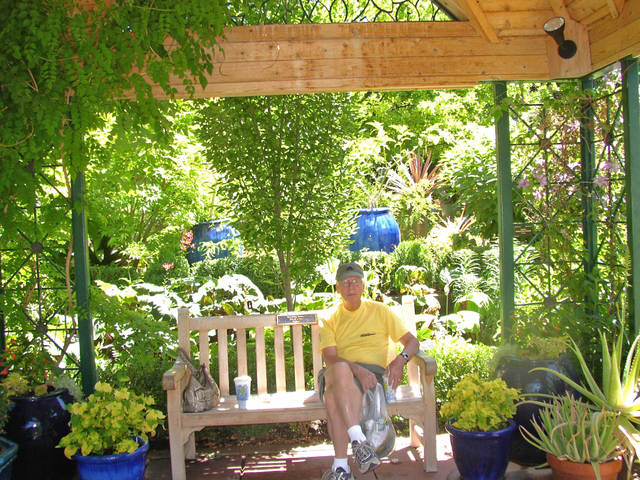 There are great examples of alcoves, conversation areas, pools and ponds. Last Wednesday we had lunch on a gazebo bench with the most gorgeous surroundings of flora and fauna. See my husband below with our Subway take-out lunch. It's well worth the price of membership just to have a place to stop by with lunch or to go for a walk with my camera or just to smell the wonderful aroma drifting through the gardens. It's possible to view a focal point from several places and get a totally different perspective. Below is a photo of the twin towers through a lattice wall with a Robert Wick Sculpture in front and one of two Chapungu statues permanently situated in DBG just visible through the separation of the tower fountains. Two years ago our DBG hosted the Chapungu sculpture exhibit. 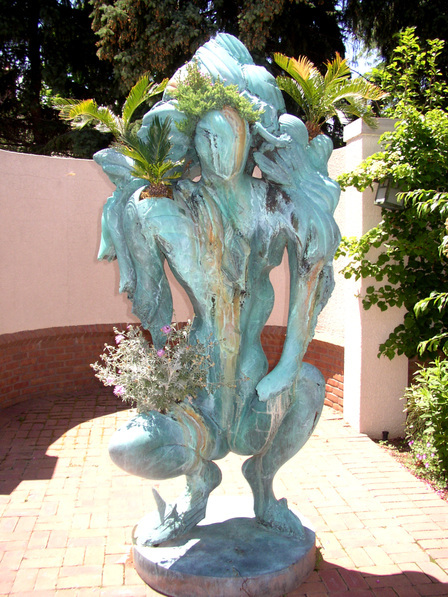 This year the gardens are enhanced by the Robert Wick Living Bronze sculptures. They are abstract sculptures in almost-human poses and sporting living plants in various crevices. I have seen them three times. First before the plants were even blooming; Second, as the first hints of color appeared and most recently with the gardens in full bloom--except for the water lilies. I am not usually a fan of tinted water in ponds but in this case it really creates a wonderful reflectiion. I plan to post a few more photos tomorrow from this same visit to the Denver Botanic Gardens. A backlit cloud building over the front range of the Rocky Mountains. As we were driving to pick up our granddaughter for our Monday play date, the clouds were absolutely beautiful, though a little ominous looking. 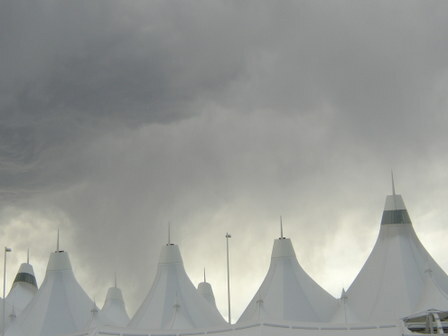 By the time we got her and drove to the Denver Airport we had this view of the outside of the airport--still ominous looking. We spent about an hour showing Clio the airport and having ice cream. As we left we once again experienced a weather change: All beautiful, All typical Colorado weather. 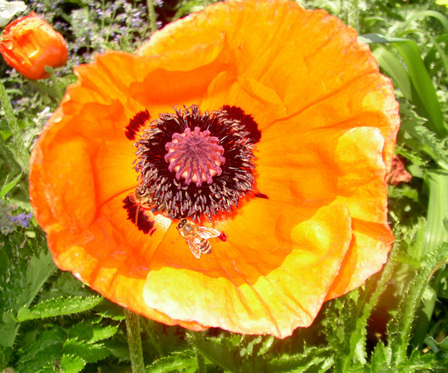 Poppies have always been one of my favorite flowers. I love the big, the bold, the brilliant flowers. I love peonies, irises, gladiolas, star-burst lilies, hydrangeas, poinsettias, anthuriums and bird of paradise.. I like in-my-face, stop-me-in-my tracks flowers. 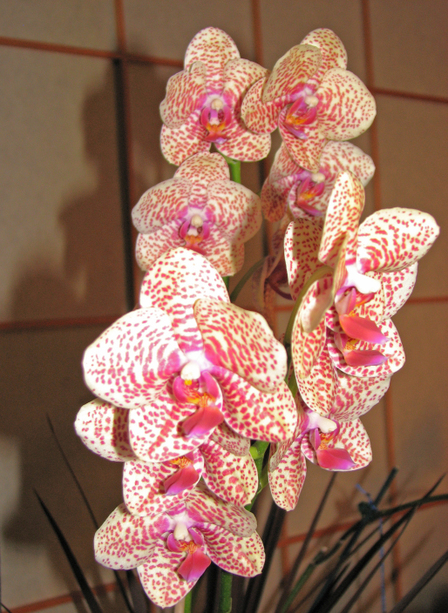 One of the few incompatibilities my husband and I have is our preference of flowers. 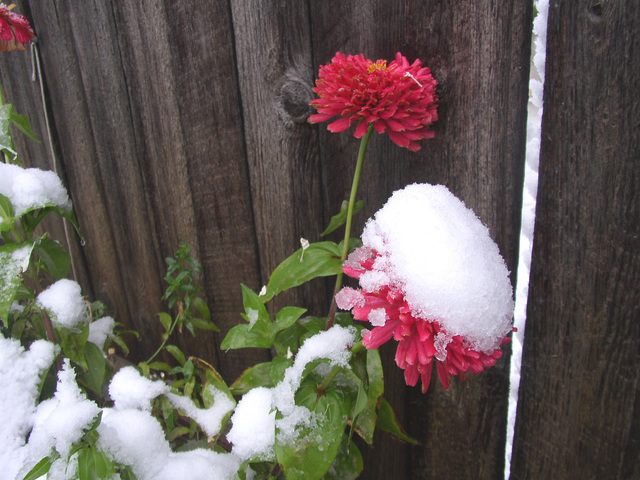 He likes small, subtle, tundra-like flowers, flowers that make their statements just by showing up and surviving all summer. He likes alyssums and white flowers with minuscule bells hanging sparsely from a vine-like stem running close to the ground. He carries a hiker's folding microscope to observe the details of each tiny bell, blossom or bud. Since he is the family gardener, except for two magnificent rose bushes and two mid to late summer Mexican sunflower plants, our flowers are petite and subtle. They are like people that need to be studied and cultivated but worth the time you spend to get to know them. 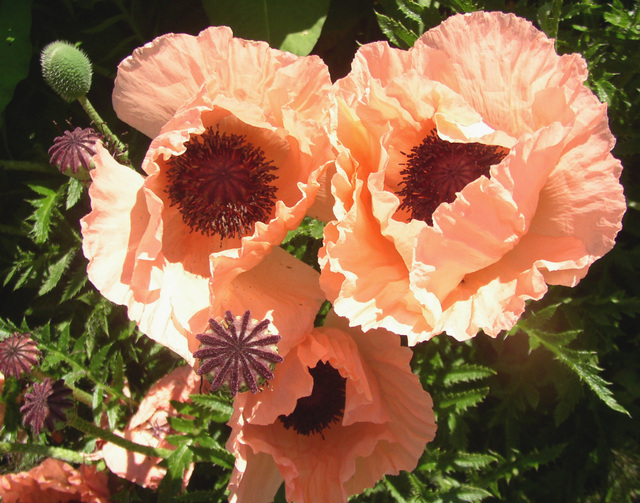 I can appreciate these tiny wonders but I love big splashy flowers--like these poppies. The lower photo actually has two bees inside, the second bee is to the lower left of the center in the main blossom..
What are your flower preferences? Jenny, a blue healer/jack russel mix (we think) who came to us just over a year ago when she showed tendencies of jealousy and behavior that was not kid-friendly upon the arrival of our grand-daughter. She belonged to my son and daughter-in-law and, since she is a sweet-tempered dog as long as she has no competition, she moved to our house. Except for her daily announcement of the mailman, she has been a delightful addition to our family. The family cat and the yard squirrels are not so pleased but they tolerate her. 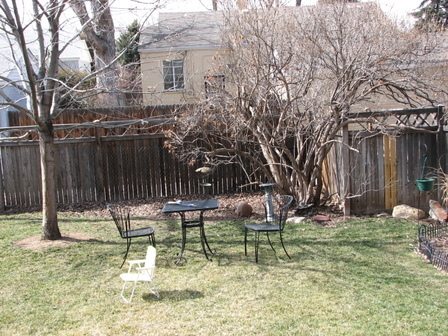 Our yard is greening up and seeds have been planted in the several blank spots--which since this photo was taken, are mostly filled in. 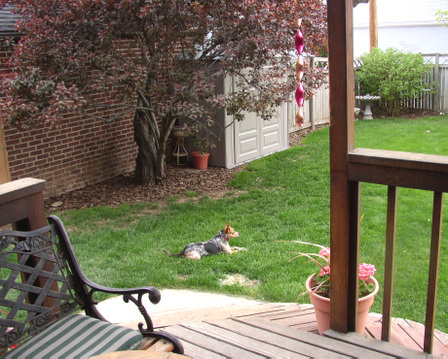 We love our deck and yard. During the summer we spend more time outside the house than inside. Walking is my principal exercise. When I tire of walking the neighborhood, I drive to favorite places and walk there. 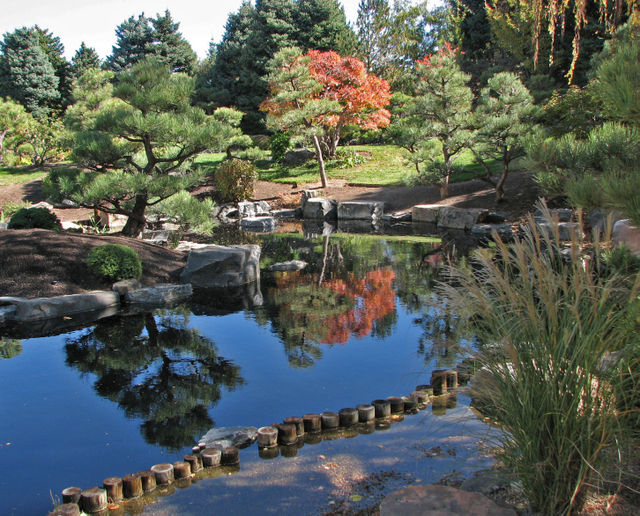 The Denver Botanic Gardens, City Park and Denver Zoo are three favorites. Today I chose the DBG and spent over an hour there. The plant beds were turned over and ready. Some showed tips of perennials peeking through the soil. 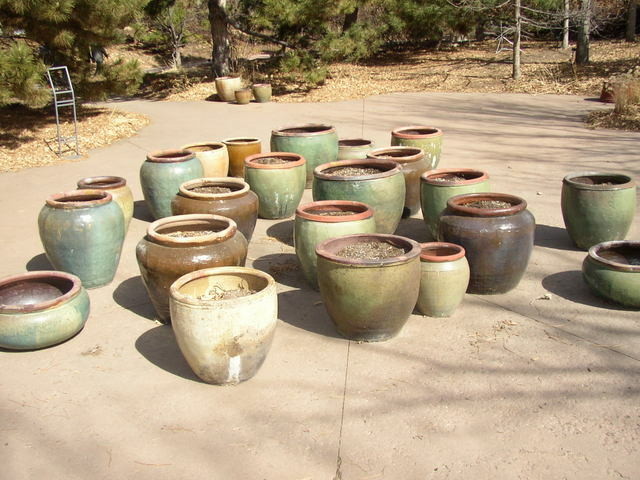 The pots were ready, just waiting the signal that it's warm enough to transfer plants from the greenhouse to pots and beds. 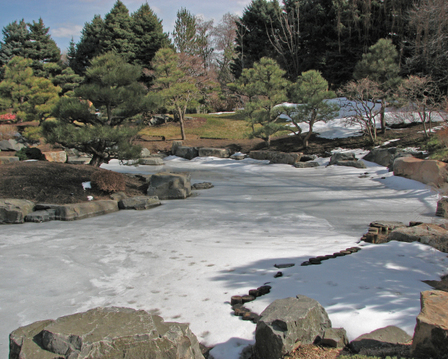 Koi had been put in the one aerated pond until the Japanese garden ponds are filled for the spring and summer. 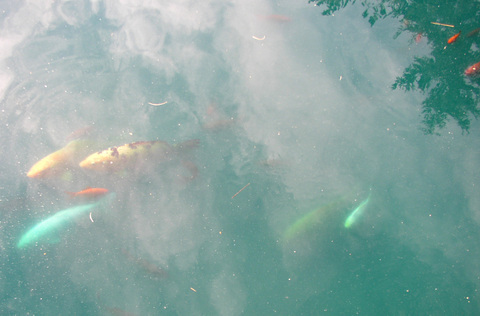 When we stepped onto a boardwalk platform near the edge of the pond, many of the koi came over to see if we had food. We didn't. (I don't feed wild animals people food.) The photo below shows the reflection of clouds and trees, the aeration bubbles and some debris. 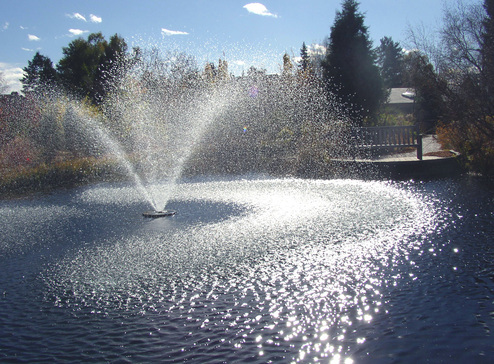 Even without the abundance of flowers, the water canals or fountains, it is a favorite place. 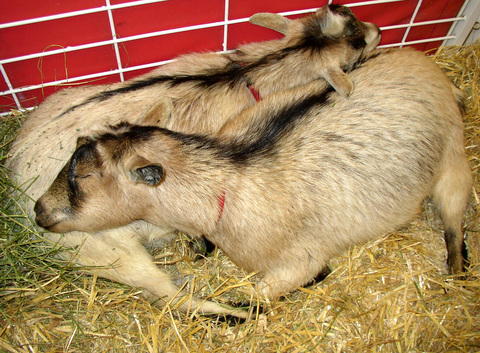 These goats from the Denver Post Petting Corral will leave tomorrow. Though Denver has long ago shed its reputation of being just a "cow-town," for two weeks every January its cow-town image re-emerges to bring a microcosm of life on farms and ranches into our city. Tomorrow is the final day of this year's National Western Livestock Show and Rodeo, however since it coincides with the Denver Bronco playoff for the AFC Championship, I suspect the crowd of sentimental visitors--like us-- will be thin. We always go at least once to reminisce, take photos and eat delicious barbecue beef and pork sandwiches. 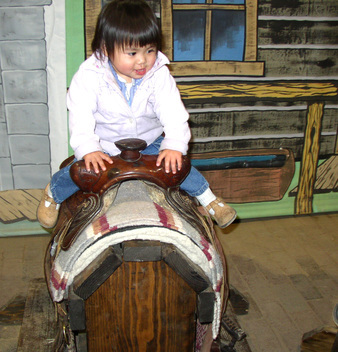 Our granddaughter Clio loved riding the saddle. She watched as other children played on it and pretended to ride and swing a lasso. She trusts completely that if we say it should be fun or interesting it will be. She is willing to try almost anything. I use to say that children are so curious and optimistic that if we told our children that we were going to celebrate their birthday with a wonderful bowl of spinach and made all the hoopla around birthday spinach that we do about birthday cakes, they would probably have a different view of spinach. Two of Clio's favorite foods are broccoli and avocado. Nobody told her that kids don't usually like those. It was great fun seeing the animals and exhibits through 18-month-old eyes. 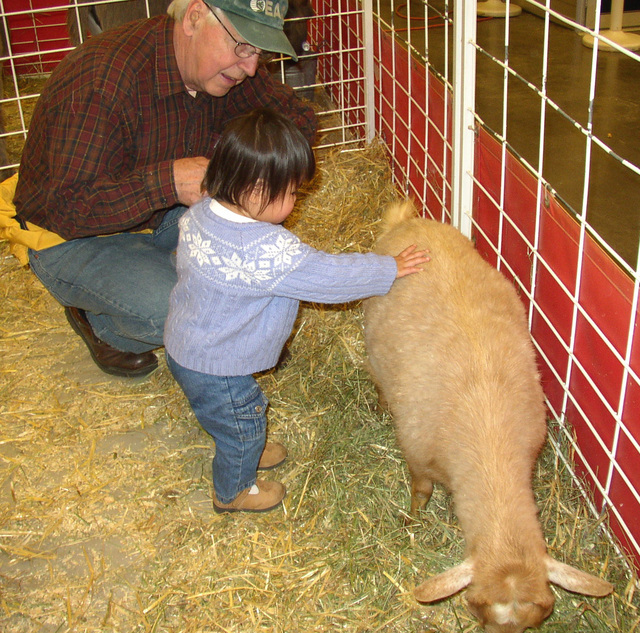 She was not at all hesitant to touch the animals in the petting corral and especially liked the pot-bellied pigs. We always like to do something relaxing on New Year's Eve. Usually that means getting out with nature in some way. 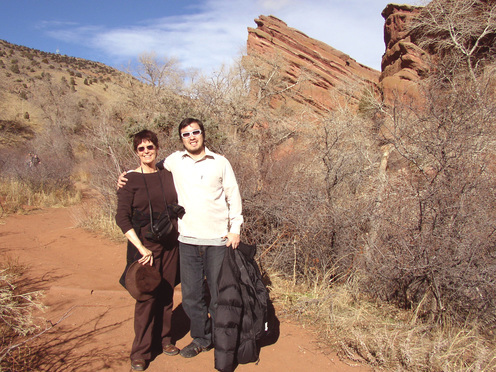 This year we decided to show Santiago, our guest from Argentina, one of our favorite places: Red Rocks Park. 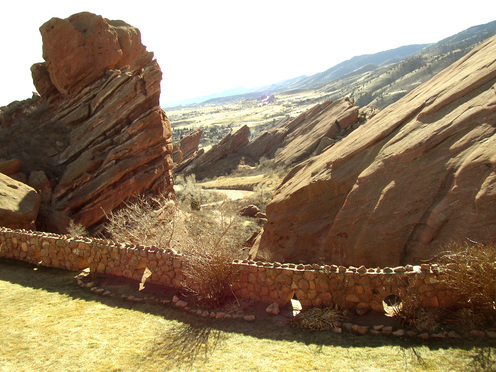 We arrived to catch the rocks and amphitheater in morning light. We toured the visitor's center, checked out the geological unconformity where rocks 300 million years old are uplifted against rocks 1.7 billion years old. We walked out to view the amphitheater where a running group from a middle school were running up the bleacher seats as a training exercise--and making it look entirely too easy. Finally we walked the 1 1/2 mile trail through the red sandstone rocks, marvelling as always at the majestic views just around every bend in the trail. After the morning of peace and restoration we made it home in time for Bob to watch the Bronco game--which they won. They are now in the playoffs. We have our fingers crossed. Could this be the first playoffs since Elway? The banner announcing the current featured exhibit on human biology. 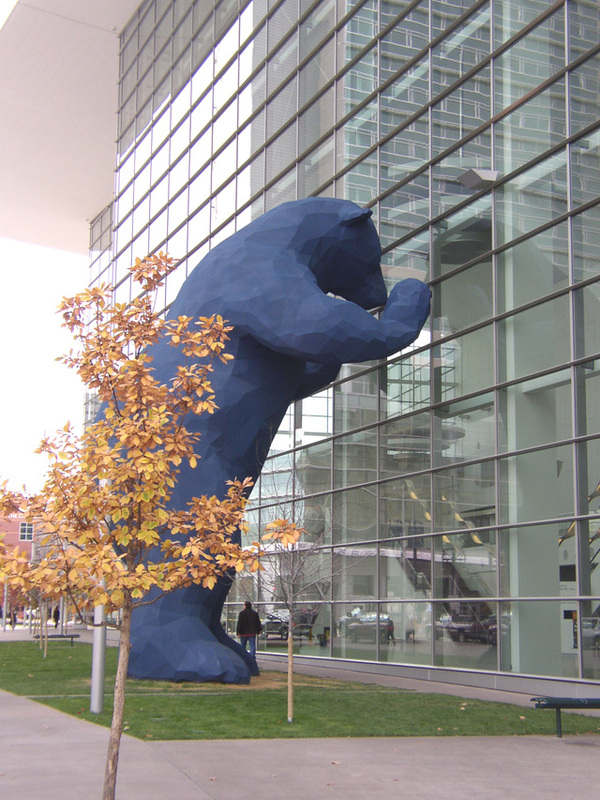 Today Bob had two school tours at the Denver Museum of Nature and Science. I took my camera and sketchbook journal to pass the two hours while he was busy, then joined him for lunch at the spectacular salad bar and T-Rex grill. I got side-tracked in the Grossology exhibit so I didn't use my sketchbook but I took lots of photos of the school kids truly enjoying the "grosser" functions of the human body. 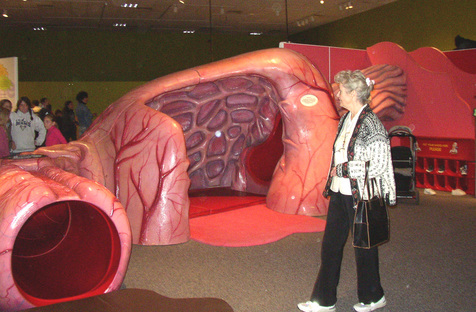 A giant simulation of a human intestine. 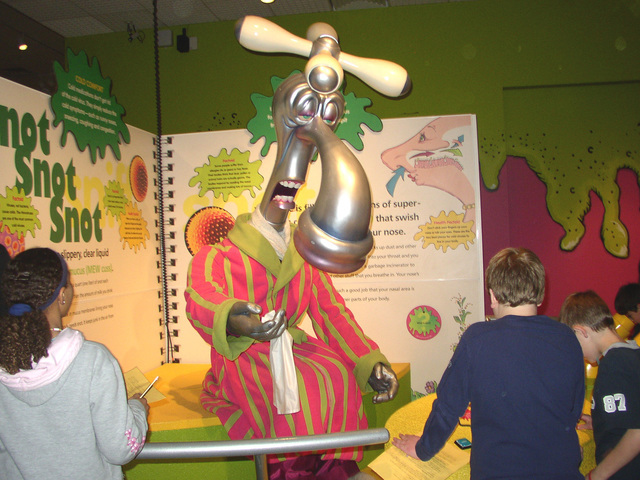 The vocabulary and walk-in exhibits dealt with such topics as snot, boogers, farting,belching and vomiting. It was possible to climb a ladder and slide through a gigantic intestine, to walk inside a nose and to examine under a microscope such things as mucous and items actually captured on nose-hairs. The exhibit above featuring a presentation on snot and boogers by a talking nose/faucet was one of my favorites. 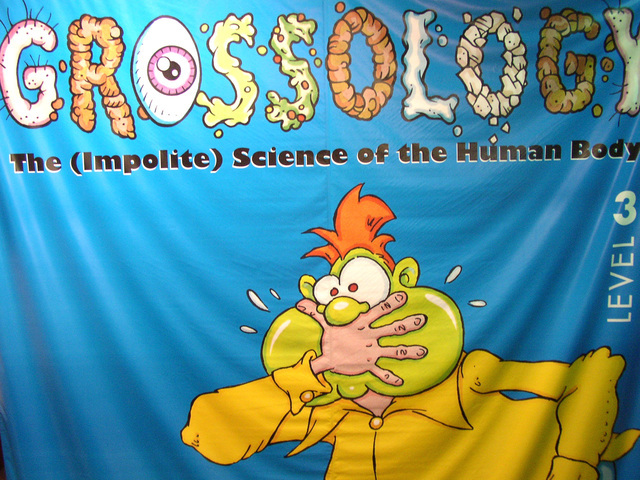 Another was the Gross-ery Store located just before the exit, in which gags, toys--and educational books, CD's and DVD's could be bought. This museum is such a treasure. In a time when science is being publicly discounted and manipulated, it is a pleasure to see education that really captures the attention of students and teaches them about their bodies--with a little good-natured humor. 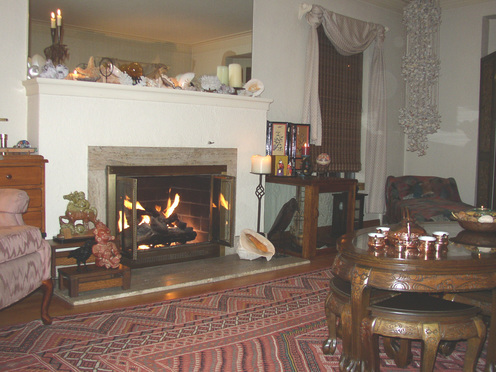 The first fire of the season in the living room of our 65-year old house. The last few nights the low has slid to around 20 degrees Fahreheit with the days topping out at 40. There is a chill in the air that puts a flush on my cheeks. I love it. I miss the freedom of running outdoors without a jacket but I'm ready for a bit of dormancy. It has been an emotional year of loss and sadness and I'm ready to curl up in my easy chair, light the fire, sip a glass of my favorite Malbec wine and cocoon a bit. Anyway I've felt this year that the world was very much usurping my life, my energy and my optimism. I hope in just one month to reclaim a joyous outlook for the coming year. The family reunion I attended last week was a great beginning. I was reunited with family members with whom I differ on political and religious views but with whom I share a deep sense of family traditions and roots. 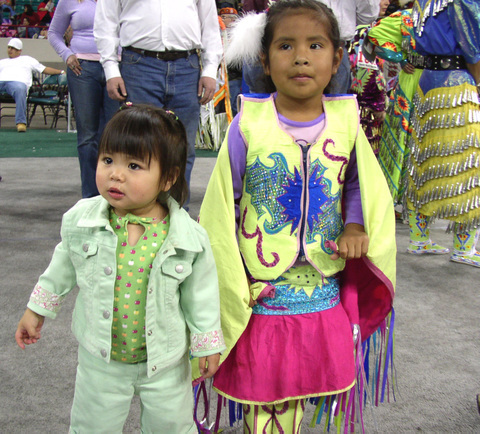 It was wonderful to see a new generation of children growing up with some of the same customs and attitudes about family that I cherish--not a bad foundation if I do say so myself. Yes, it bodes well for a postive and joyous 2006--and I'm getting a head start. For at least 10 years this distinctive building has stood against "progress." One of the things I love about Denver is that there is a good mixture of past architectural styles alongside the new. Our city is diverse, not only in its people and attitudes but also in its architecture. One of my favorite ways to pass time is to take the self-guided--and sometimes guided--walking tours through our city. 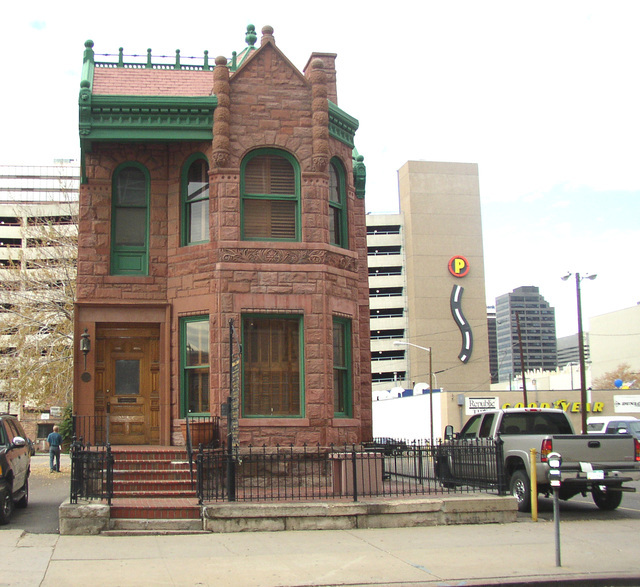 We still have buildings standing that were here in the silver-mining days of Denver's origin. I love this old building and applaud its owners, whatever their motivation, for holding out against what I call "parking lot polution." I vaguely remember other such buildings beside it but they were demolished long ago. I've walked by and photographed this pond many times--in all seasons--over the years that we've been DBG members, but yesterday was the first time I've ever seen the fountain functioning. This one I took with the sun at my back. But for fun I took several directly into the sun. One of those is below. I desperately needed a dose of nature yesterday. On Wednesday we received a call that we had been the victims of check fraud and that a woman had helped herself to a large chunk of our checking account. They have the person's name and a copy of the check and it is probably just a matter of time before they catch her. She knew the first of the month is when the largest balance would occur. We have spent the last three days cancelling the old and opening a new account, filing numerous reports with police and various check fraud entities including the postal inspectors as it now seems clear that one of our checks was stolen from the mail and counterfeited using that routing, account and check number and the forged signature of my husband. Though they removed the money from our account, the bank held it in their possession until they could get some answers, and yesterday they returned it to us and I was able to get some temporary checks to use while I wait on my ATM and debit cards. We have been encouraged to attend a free seminar on identity theft and check fraud sponsored by our bank. I may go just because our bank has been superb in stopping the financial damage that could have occurred. From now on we are using our bank's free on-line bill-payer service--no more "checks in the mail." For thirty-two years I have loved this tree. We have paid far too much to prevent birch bore infestation and even have purchased a special root feeder to keep it alive and healthy. 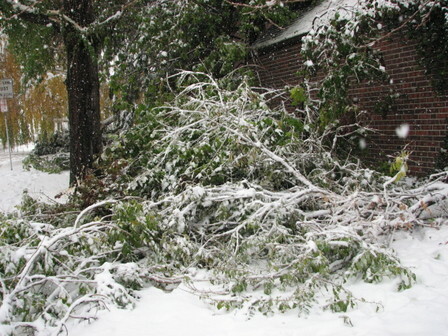 When--on a cold icy day 25 years ago a car slid through the corner stop light, bounced off the juniper bush and into the tree--I called a tree doctor to see what we needed to do to keep it alive. This occurred the day before the juniiper bush was to be removed. (At the time I didn't like the juniper bush.) When I realized that the bush and the tree had saved our house, I cancelled the bush removal and we have happily pampered and pruned both of them since then. This tree has always been my favorite of the ten we have around our house. All but two of them are over 60 years old. I must apologize for the composition of the photo but the only way to get this view from this distance was through a stairwell window. 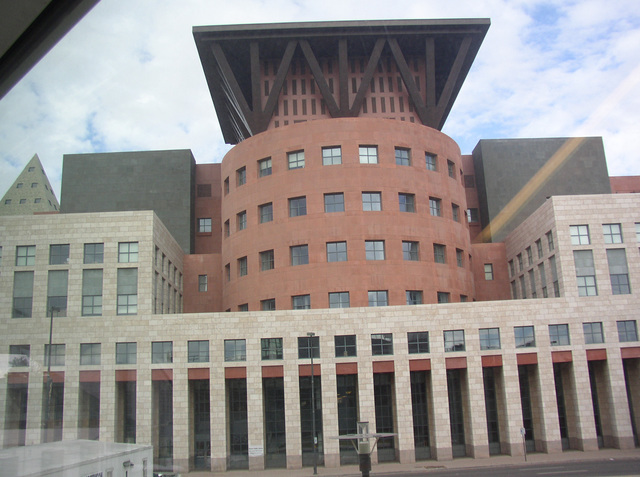 One of the first events held in the rotunda of this library was the Summit of the Eight in the mid-90's. It is one of my favorite places. Inside are many nooks and crannies for reading, writing or researching. The next photo shows the view from the back of the library. 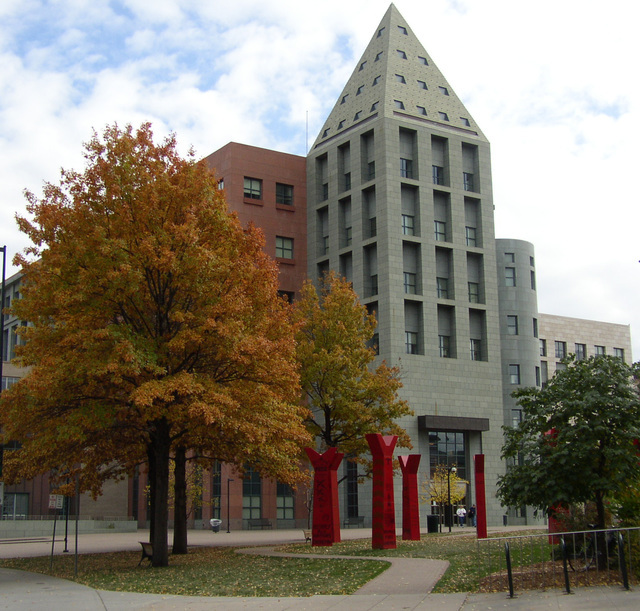 Just across a small plaza is the Denver Art Museum which is now undergoing a mammoth addition designed by Daniel Liebeskind who was subsequently chosen to design the 9-11 Memorial at ground zero in New York. 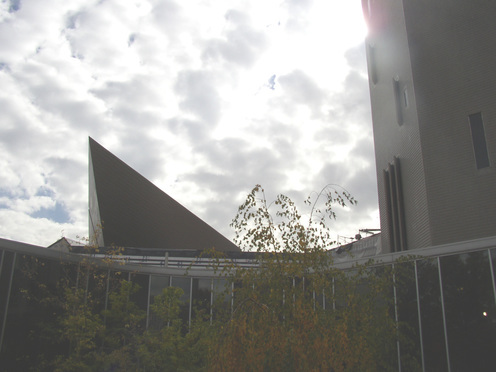 A photo of the original building, designed by Italian architect Gio Ponte in the early 70's, shows the new titaniam point of the Liebeskind-designed Hamilton Annex rising above the museum entrance and sunken courtyard. 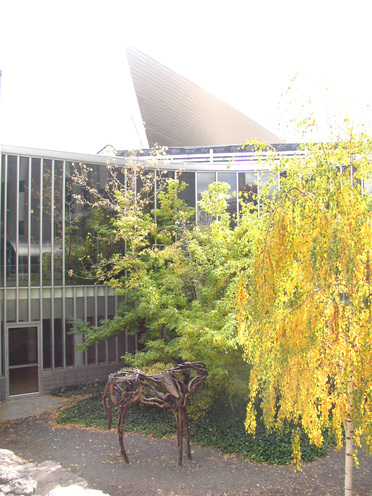 And finally, a photo of the courtyard itself --which features one of four Deborah Butterfield horses owned by the museum. This photo was taken in the cloudy afternoon and the one below was taken when we first arrived in the morning. The new addition has been complete for quite some time and I had heard about the "blue" bear but I had no idea how big it was nor just how blue. Yesterday we went downtown to the library and art museum. Afterward we decided to walk the several blocks and see the bear. It is an amazing sculpture. Some have scoffed at calling it "art" but I love it. It was an overcast day so I didn't get really good reflections but I'll put the one I got below. 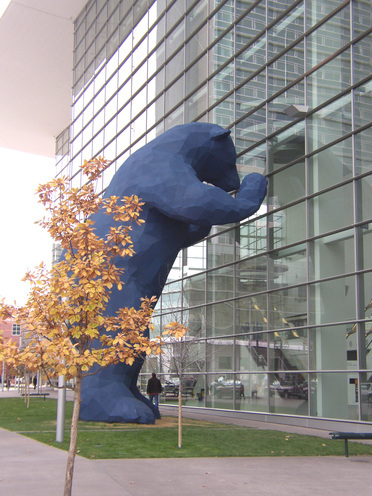 To read about how the bear project began, click here. Bob standing beside the bear. The view looking South on my street. Autumn is going and with it the magnificent color that I love. This photo was taken a few days ago as a windy day encouraged the first leaf drop. I decided I better take a few photos before we moved from color to black and white for the winter. 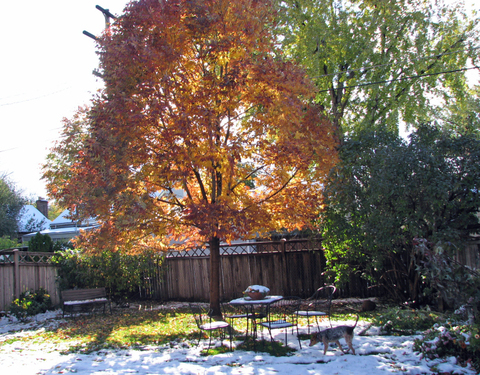 This tree in my back yard was at peak 5 days ago and every day we wake to find more leaves piled on the ground. I really mourn for the loss of autumn every year. It has always been my favorite season. 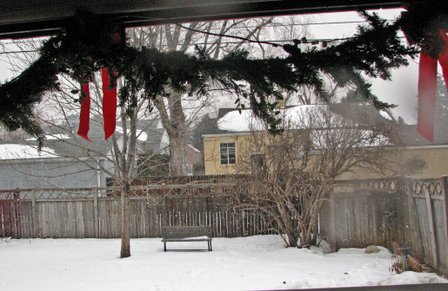 The climate is moderate, except for the occasional unseasonal early snow. It is perfect walking, bicycling and being outdoors weather. In fact I have been outdoors so much I haven't been doing much painting for my art class tomorrow. Yesterday when we picked up Clio, we brought her here to play in the leaves as there are few trees in the newer neighborhood where she lives. 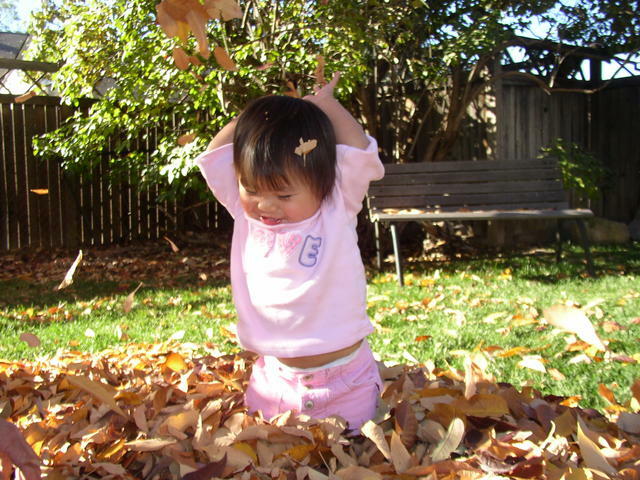 She was wary at first but finally began throwing leaves with real gusto. I recently joined the Friday photo site. I finally figured out how to link it to the site so decided to play. The theme for this Friday was "Conspicuous" and I think this photo, taken about two weeks ago, definitely qualifies. The Forney museum is a collection of cars, buggies, bicycles and trains. 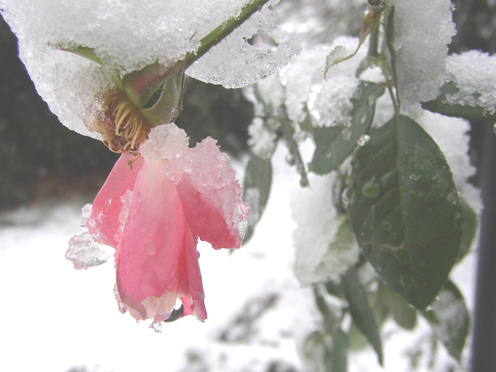 Our last rose caught by an early snow. 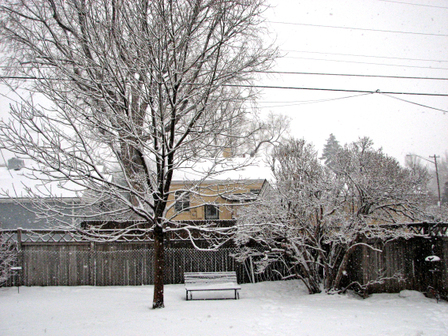 We awakened this morning to a garden on its knees, branches and stems hanging heavily with the weight of an early wet snow. I put on the coffee and grabbed my camera as Bob dressed in rain gear and grabbed the water hose. While he hosed the snow off the tree branches to keep them from breaking, I snapped photos of the remnants of this summer's plantings. 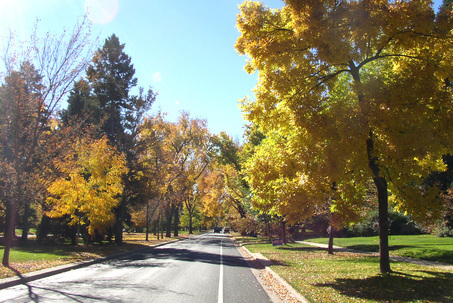 Our trees were just on the verge of turning colors so now I believe autumn will begin in earnest. 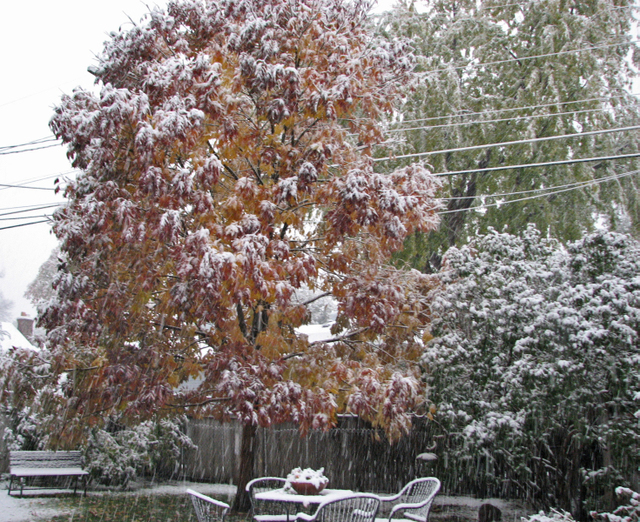 Several times in the past we have lost huge portions of our 60-year-old trees to early autumn snow and ice storms. As I am writing this a few hours later, the snow is already beginning to melt but the temperature is predicted to top out at 37 degrees Fahrenheit with below-freezing temps during the night. 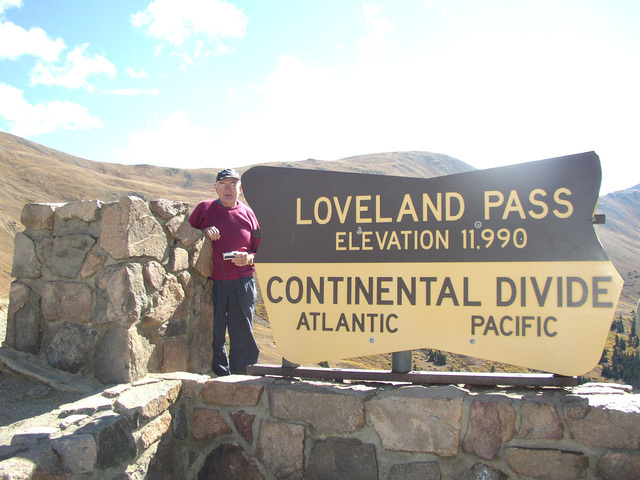 Taken a week ago at the Continental Divide on Loveland Pass. At the time we were hosting Bob Sims, a Servas traveler from New Zealand, and he had planned to book a tour for almost $100 to take him to Georgetown and Loveland Pass--two of our favorite places. So we took the day and thoroughly enjoyed showing him our Colorado mountains. The Continental Divide is a place where, hypothetically, a rain drop falling on the West side would flow into the Pacific Ocean and one falling on the Eastern side would make its way to the AtlanticTo my knowledge it has never been confirmed but it makes a great story and photo opportunity. 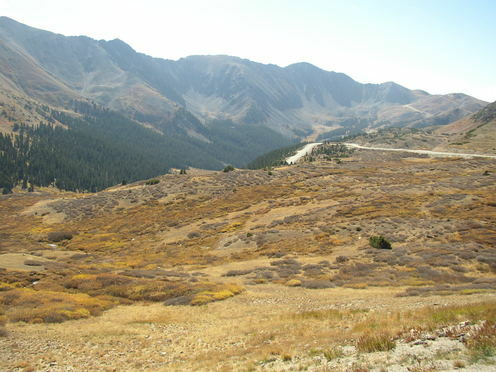 It is also a really beautiful place with spectacular views above timberline in all directions. After the pass we retraced our path back to the Georgetown Depot and arrived just in time to see the Georgetown Loop Narrowgage train pulling in. We waited until it had re-boarded so we could get photos of it as it switched the engine and then went over the trestle. 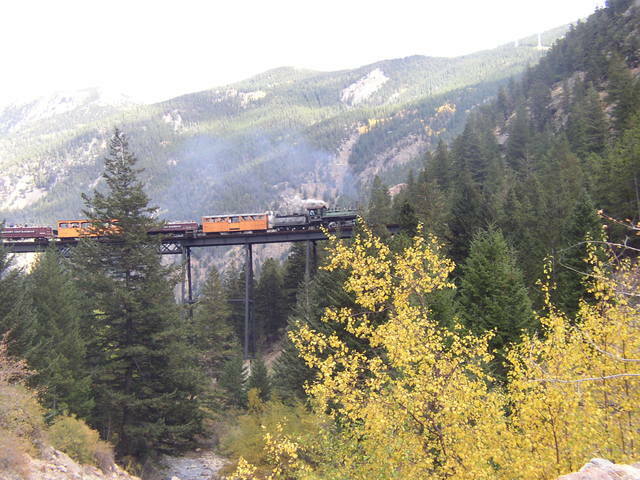 The loop trestle was an engineering marvel at the time as the "doubling back" over the trestle enabled a smaller engine on a smaller track to gain the speed and altitude necessary to carry machinery and silver between Georgetown and Silver Plume Mine. 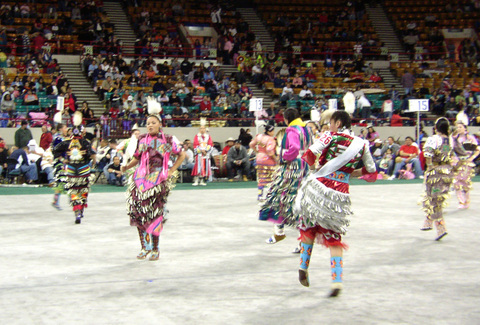 It is now operated in conjunction with the Colorado Historical Society. I was busy taking photos but when I turned around I saw Bob Sims in an animated conversation with the woman who had just helped board the passengers on the train. It seems she lives a half year in Colorado and the other half in his home country of New Zealand. Instant kinship is created by a familiar accent. Afterward we walked in Georgetown, got caught in a rain storm and took shelter in a museum I might not have entered otherwise: a water and energy museum. It was actually quite interesting and we met our first "character" of the trip. The guide was a woman who was formerly a mechanical engineer--now retired. She told us she had been the only woman in her graduating class of engineers. She also let it slip, in a hushed voice, that she wasn't supposed to be political in her job but she really couldn't stand what Bush was doing to our country with his anti-environmental policies. When we assured her that we agreed with her, she really opened up and vented against him. When the rain stopped she was still venting. We did learn a lot about hydrology, however, before the venting began. 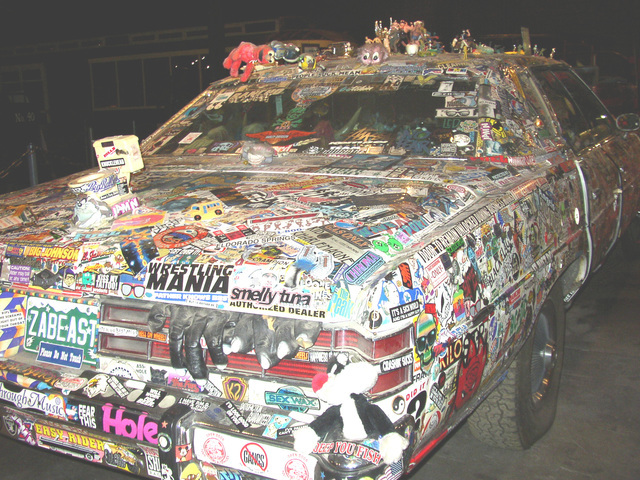 I love eccentrics. Usually their opinions are honest and without malicious intent.